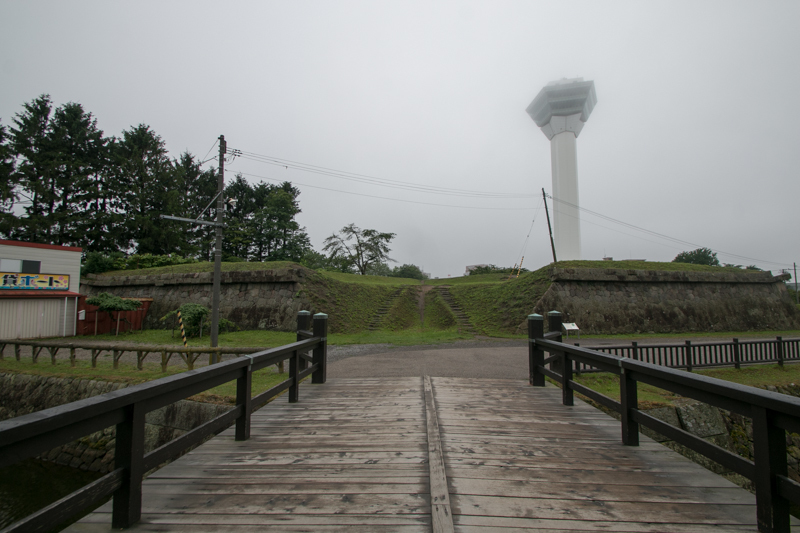 Since medieval era, main land people immigrated into the coast area of Oshima peninsula, and built 12 colonies having each castle. 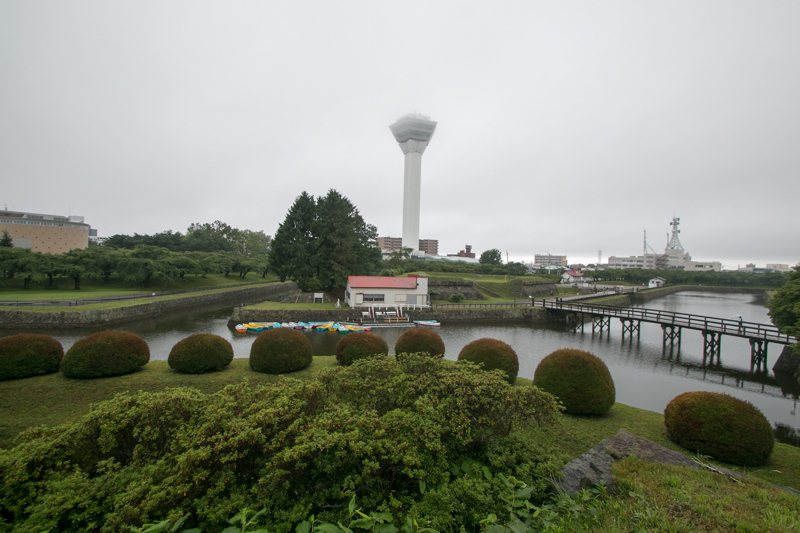 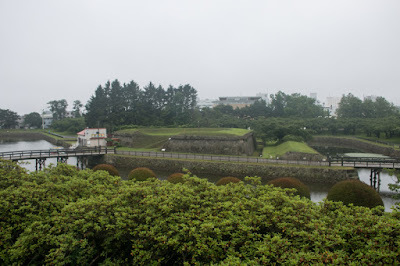 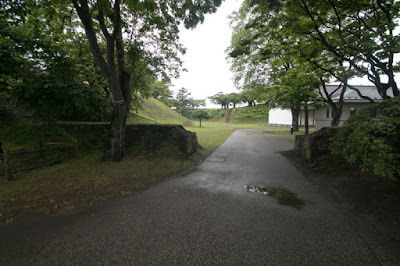 Around Hakodate area, Usukeshi castle and Shinori castle were built at seaside area. 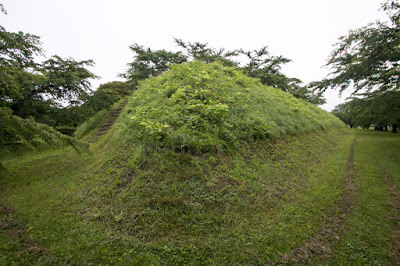 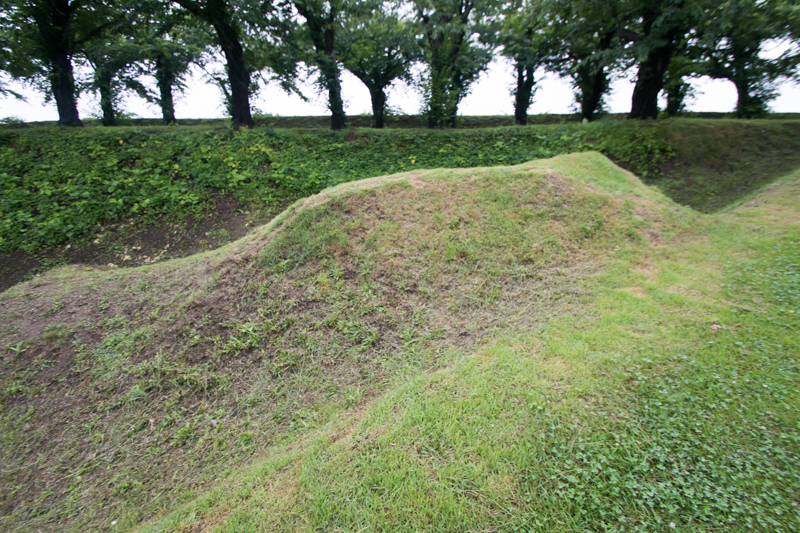 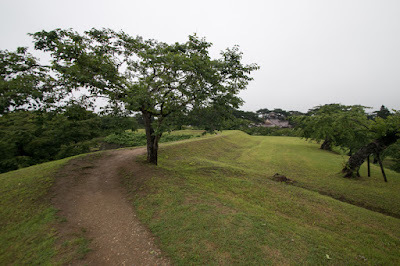 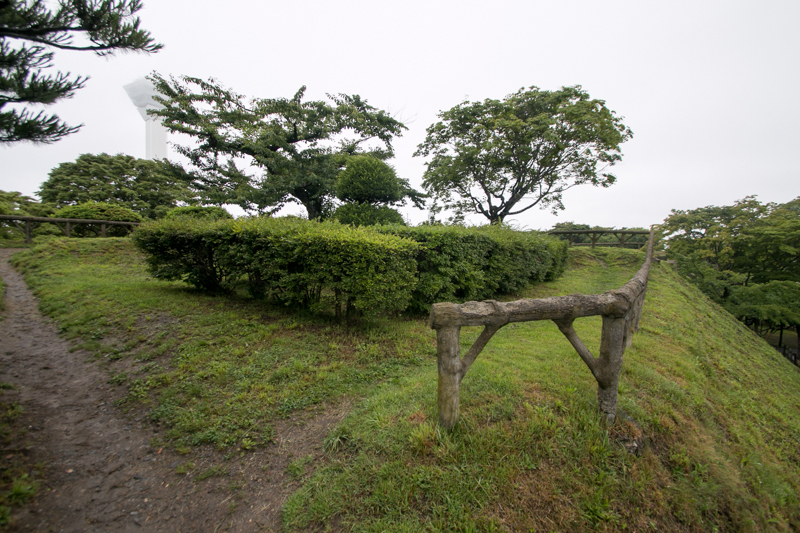 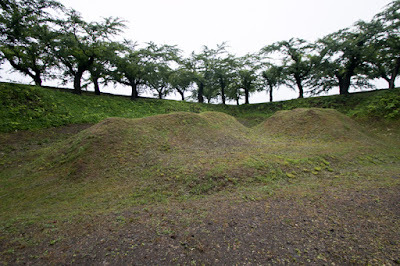 But these castles fell during the battle of Koshamain, a large uprising of local Ainu people, and survived people moved to western part of Oshima peninsula where is still kept by Kakizaki clan. 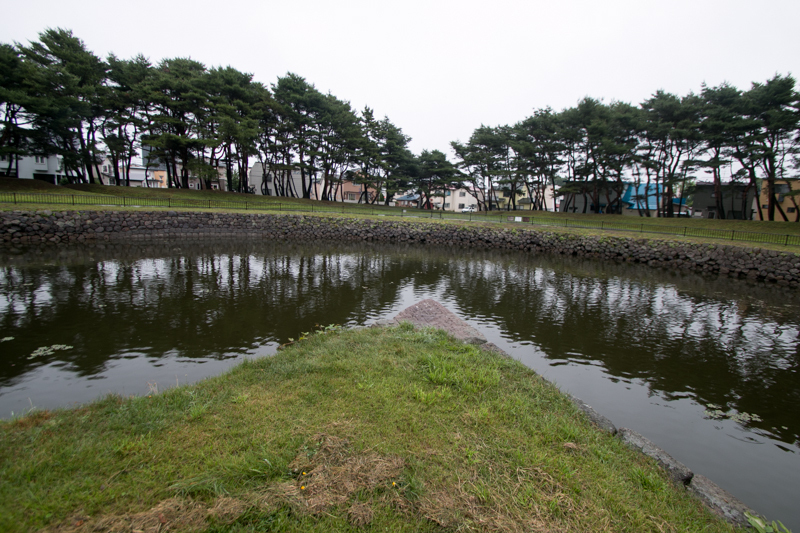 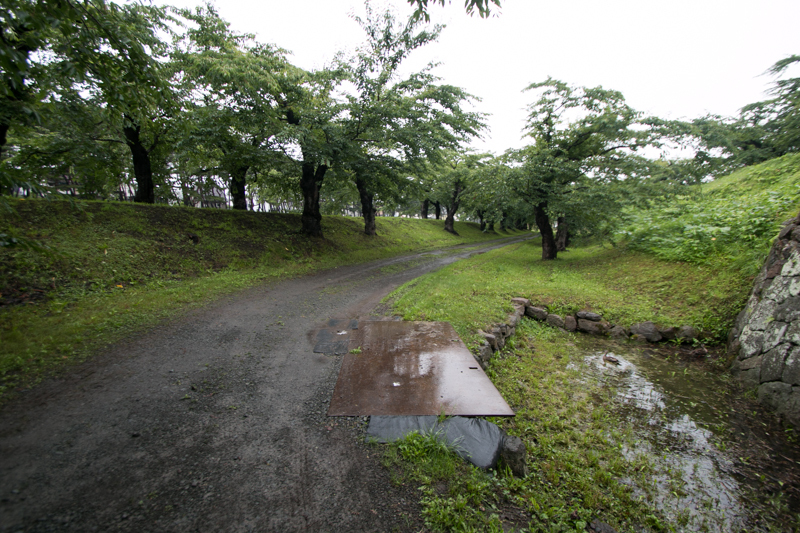 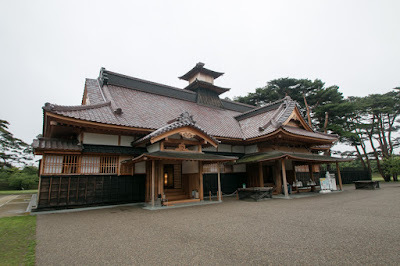 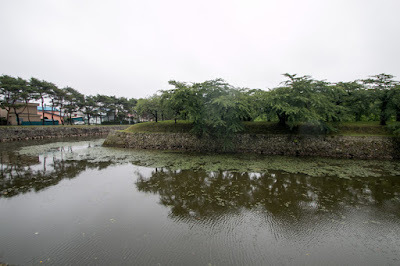 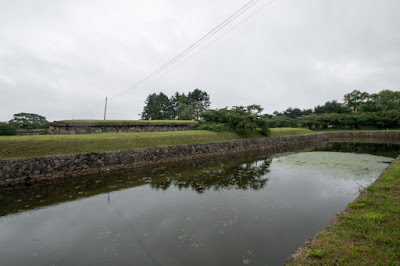 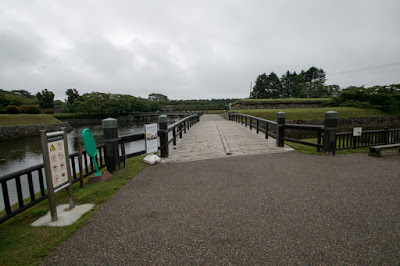 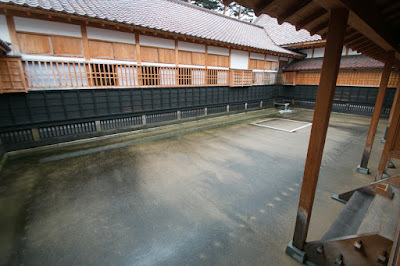 Later Kakizaki clan grew their power and became a feudal lord of Hokkaido island, but they resided at Matsumae area at the west half of Oshima peninsula, and Hakodate area had been a quiet port by the end of Edo era. 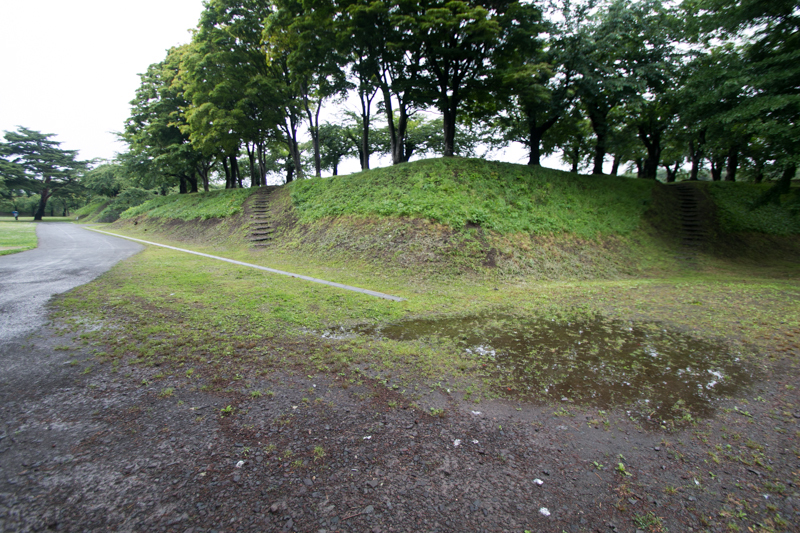 But in the middle of 19th century, the fate of Hakodate area drastically changed. 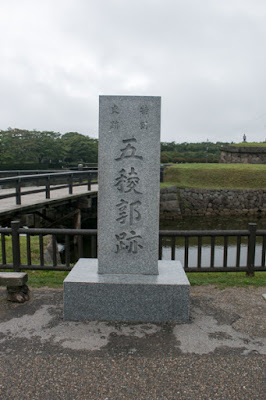 In 1854, Edo Shogunate changed its close border policy and opened the nation, under the pressure of US fleet lead by admiral Matthew Perry (1794-1858). 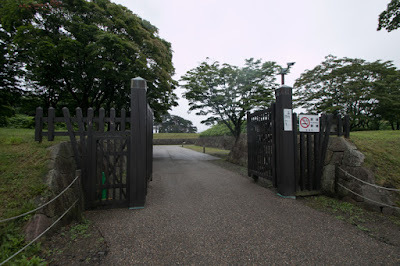 Under Kanagawa treaty, Hakodate port and Shimoda port was newly opened and nominated as a open port to foreign counties, considering to be used as supply ports to US whale catchers operated in northern part of Pacific Ocean. 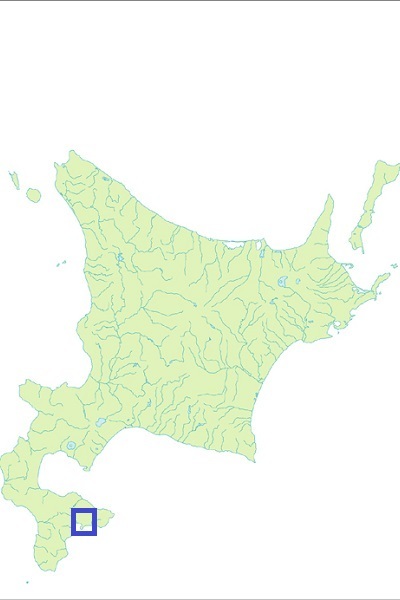 Furthermore, five years later, under Treaty of Amity and Commerce between Japan and US, Hakodate port was also nominated as a trading port along with Kanagawa port (current Yokohama port), Niigata port, Nagasaki port, Hyogo port (current Kobe port), Edo port (current Tokyo port) and Osaka port. 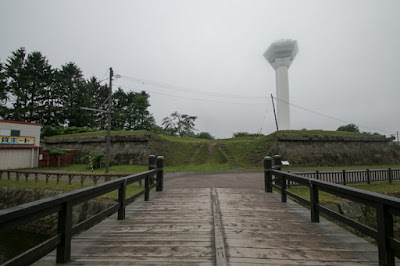 Other than the character of trading port, Hakodare area also started to had a character as a military base. Tsugaru straight which Hakodate area faces is a important route for marine transportation, especially Russian Empire which had its far eastern naval base at Vladivostok, only 200 kilometer apart from Hakodate area. Originally to cope with expansion of Russian empire Edo Shogunate gradually developed Hokkaido area, but facing strong pressure, it was necessary to strengthen the dominance at Hokkaido region. In 1854, Edo Shogunate places Hakodate magistrate to govern whole Hokkaido region. 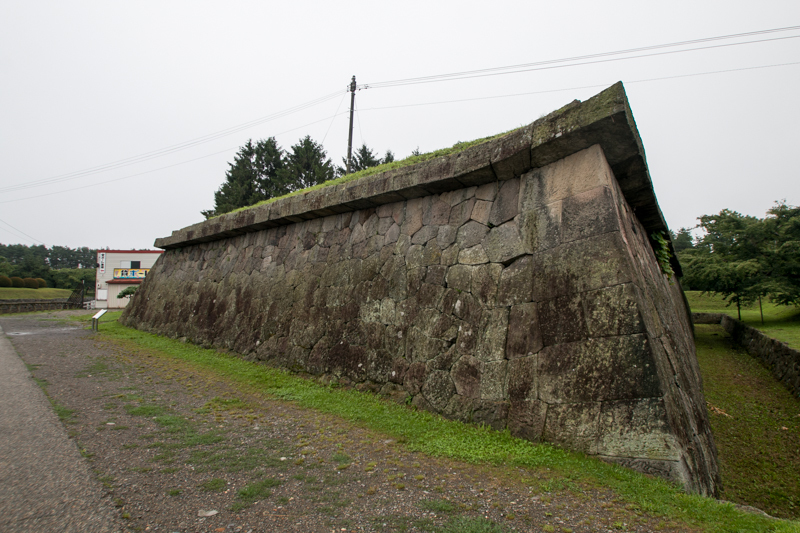 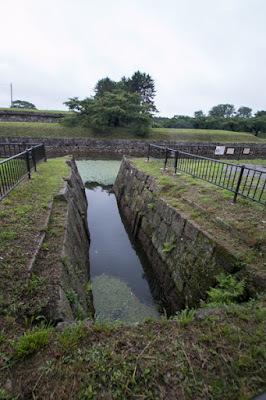 Furthermore, Edo Shogunate thought the necessity of building fortress to protect Hakodate city. 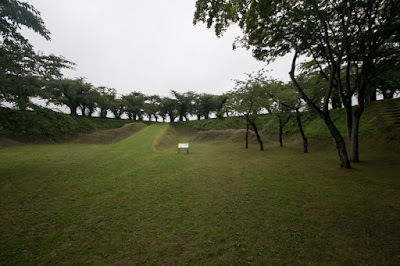 Originally it was planned to built a fort near the port, but it was too close the sea and Hakodateyama mountain and easy to be shot by cannon. Because of this reason, Shogunate decided to build a fortress at inland area, and decided the place at the root of Hakodate peninsula. 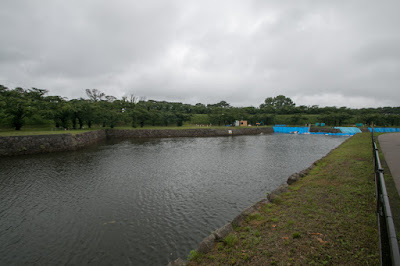 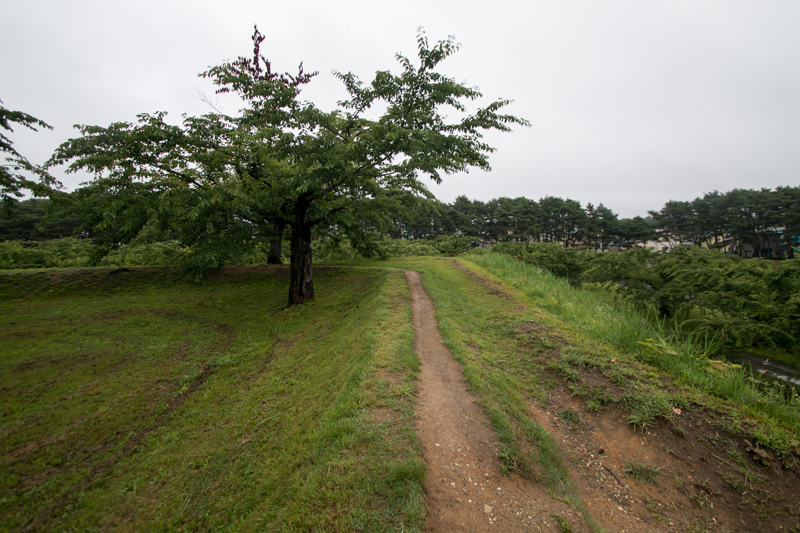 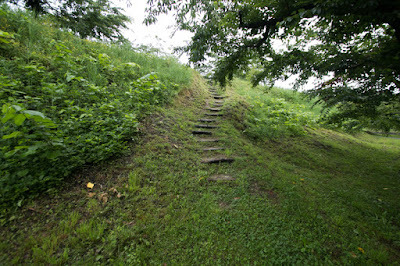 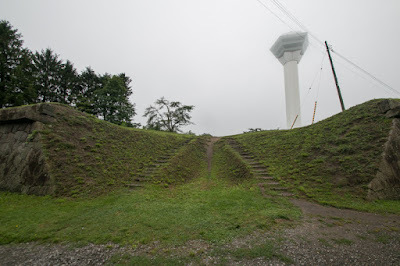 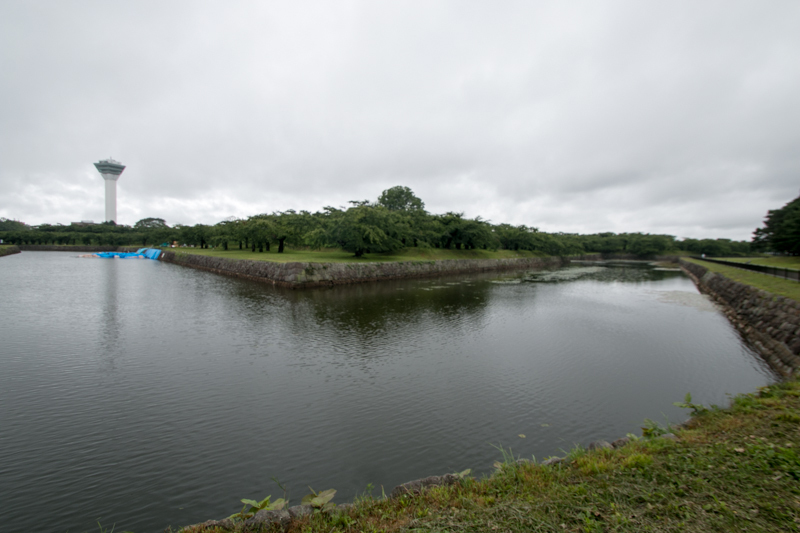 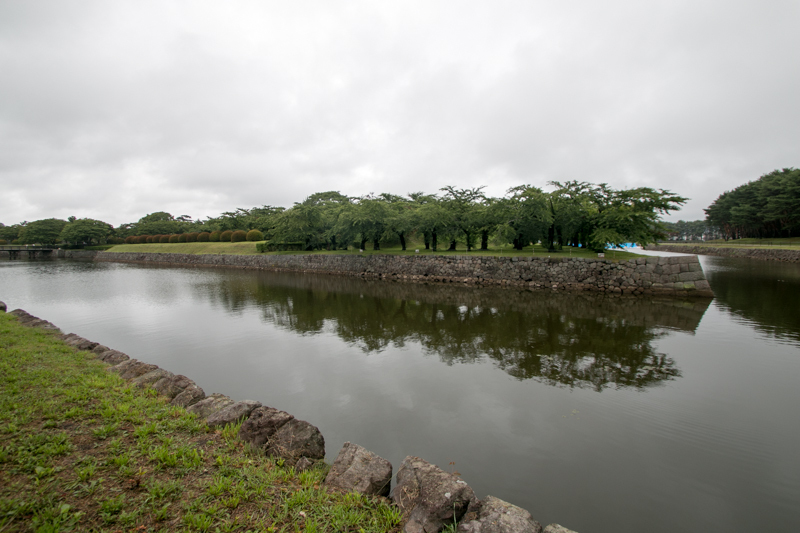 Utilizing new fortress at the root and Hakodateyama mountain, whole Hakodate area might be secured. In 1857, construction of new fortress had started. 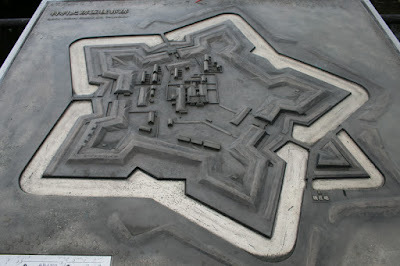 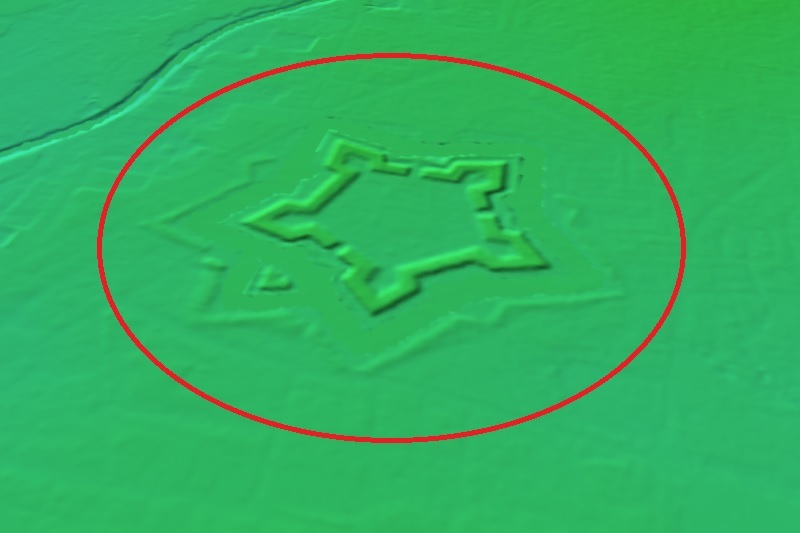 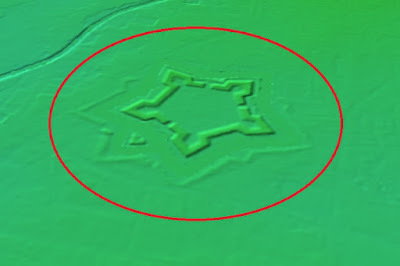 Originally complete geometric pattern like western fortress is planned, but because of limitation of budget and construction period, the plan was decreased to star like main part and only one hornwork. 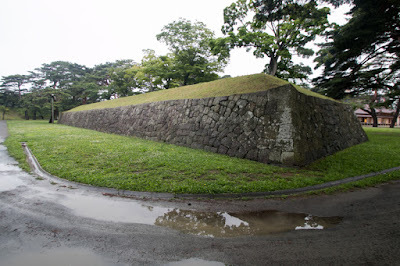 Suffering from weak ground and severe cold, new fortress completed after 7 years construction and was named as Goryokaku (Five star corner fortress). 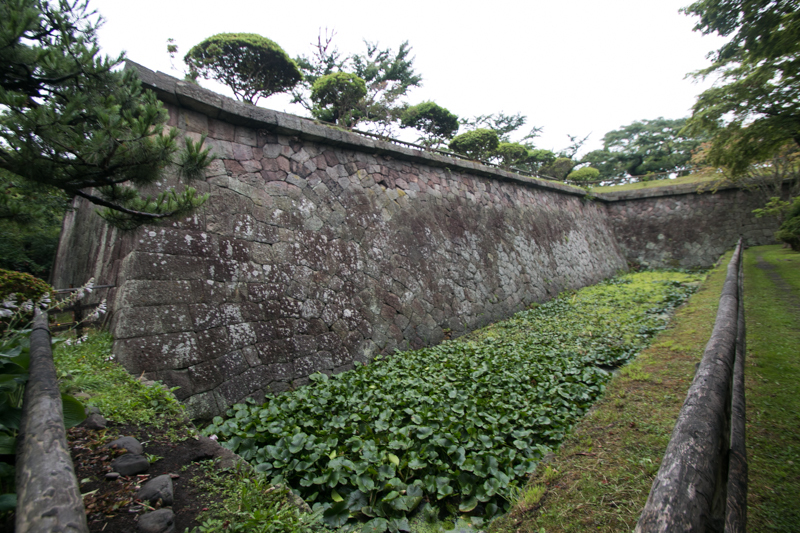 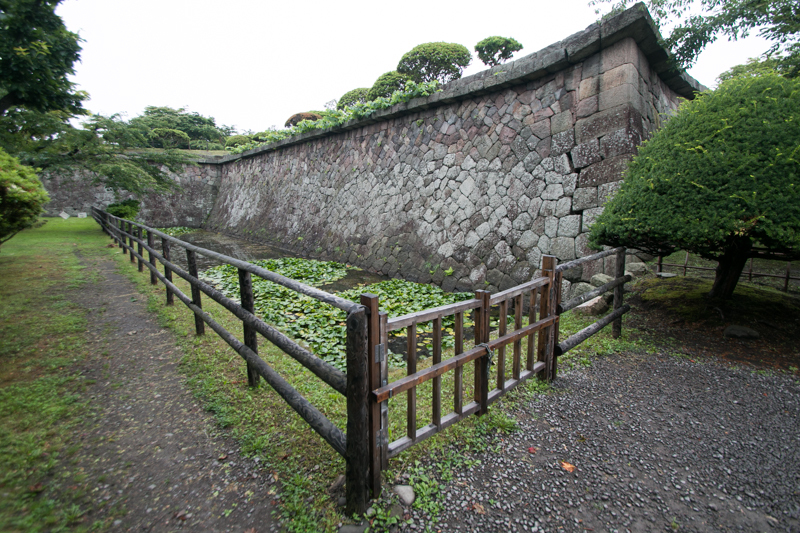 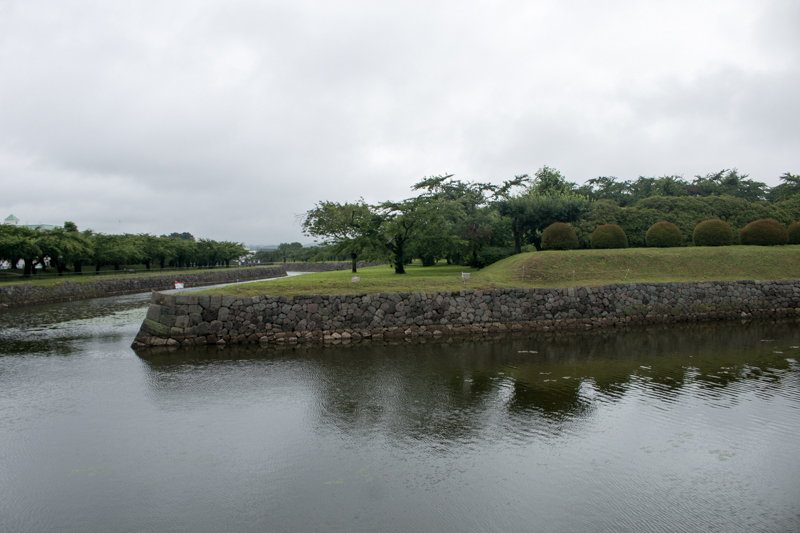 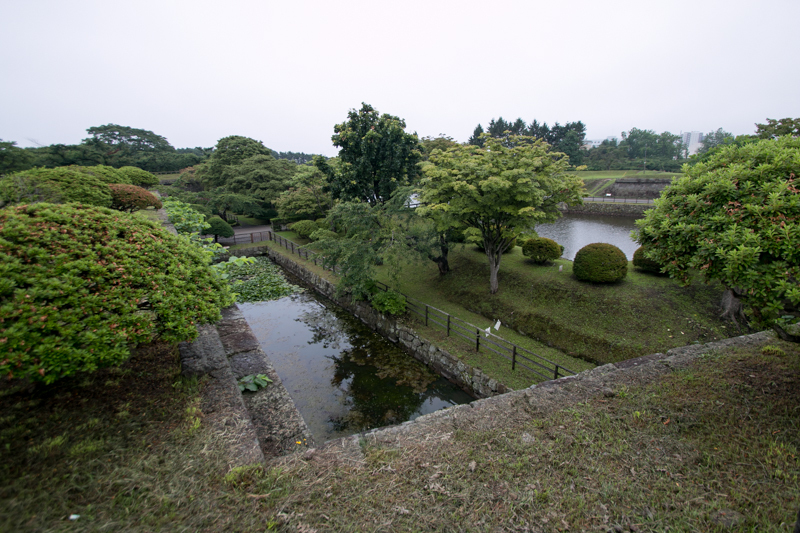 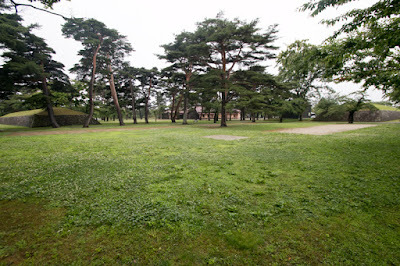 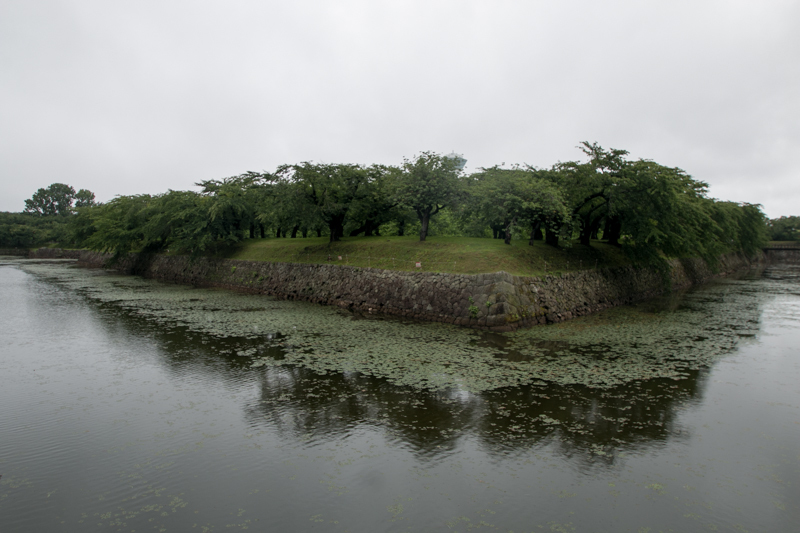 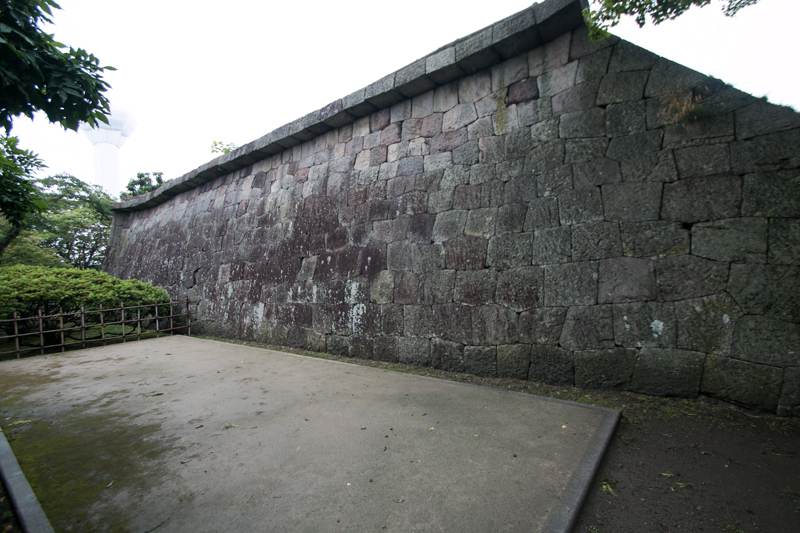 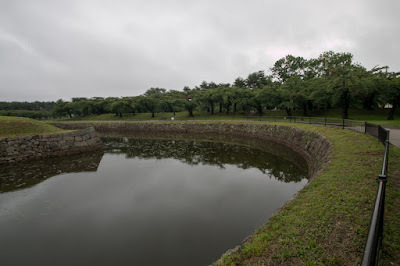 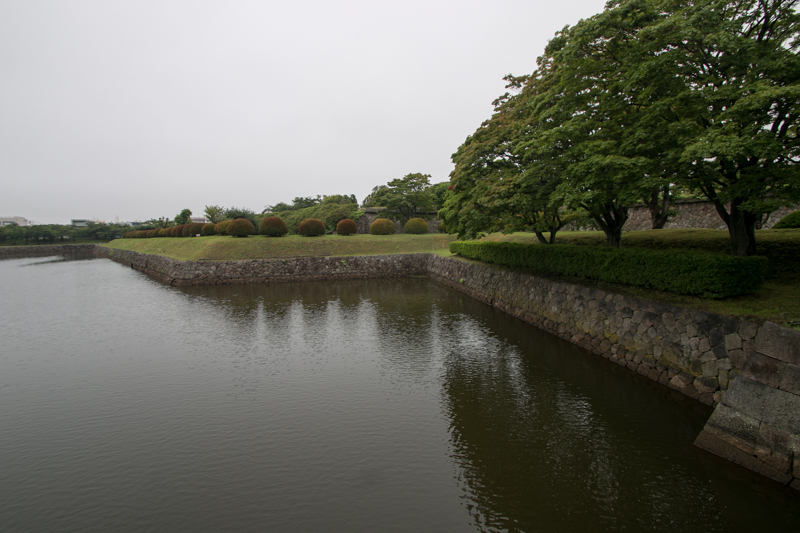 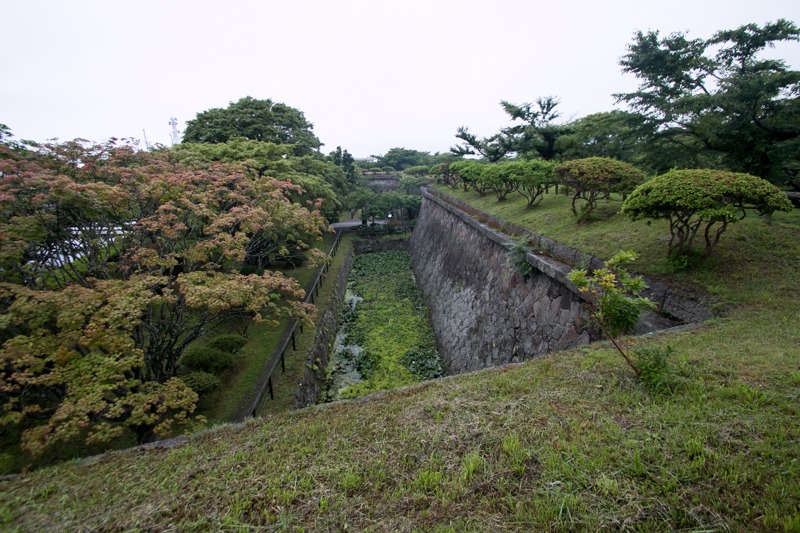 Goryokaku had a five corner star shape, which is equivalent to Italian style fortress in Western world. To minimize dead angle, each corner projects into ward and has keen angle, and middle part of each line stand back from the corner. 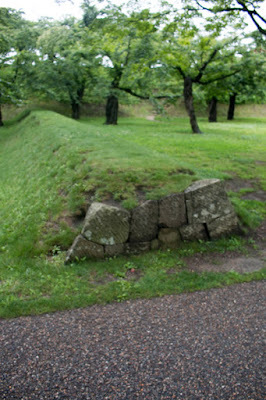 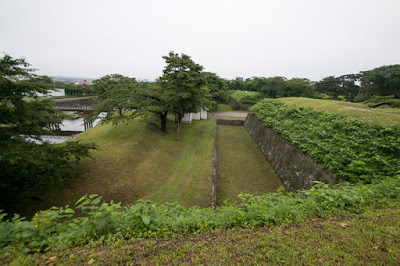 This set back surely erase the dead angle, but this might be also a weak point used for close attack by cannon, ordinary small fortress in Western world built a small separate front fort at this setback point. 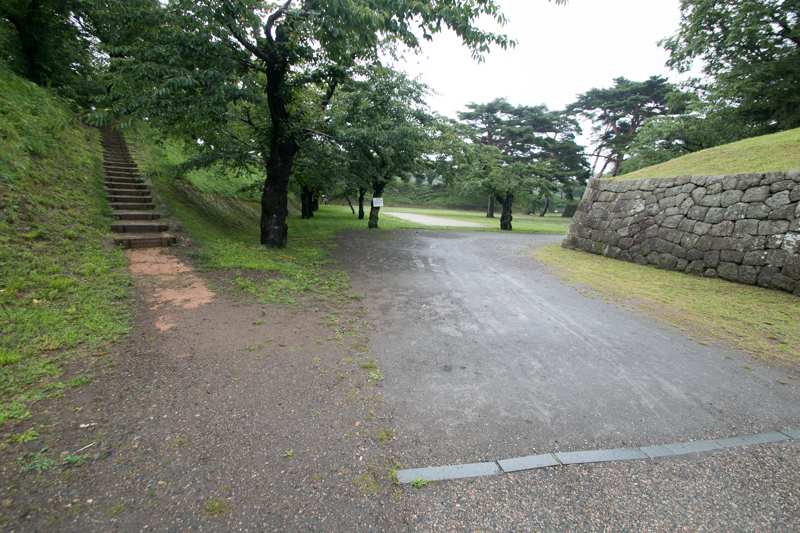 As above originally Goryokaku was planned to have this hornwork at all line, but finally was built at only southeast line, where main gate exists. 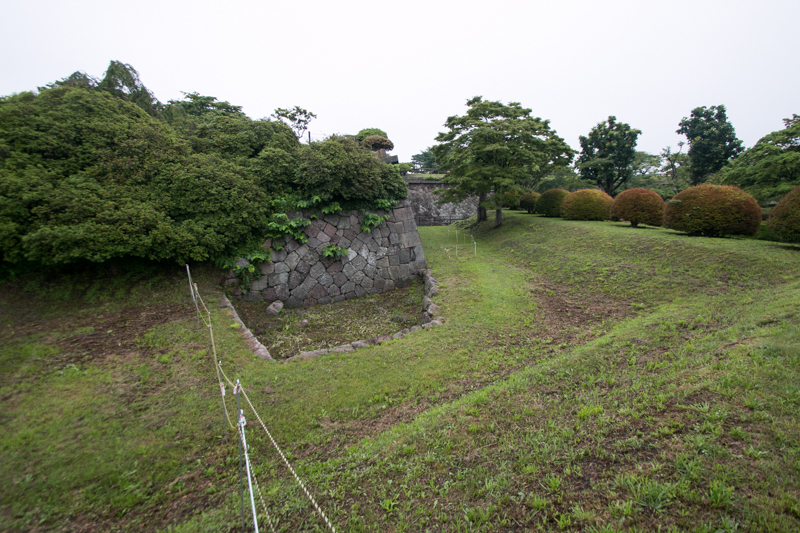 Each line is protected by clay wall of two layer, and the lower layer consist the body of the castle and the upper layer was built to protect buildings and soldiers by attack of cannons. 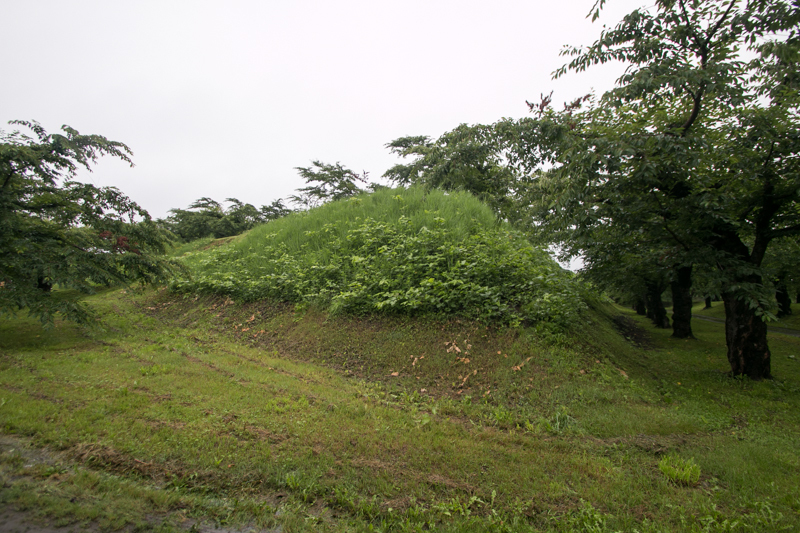 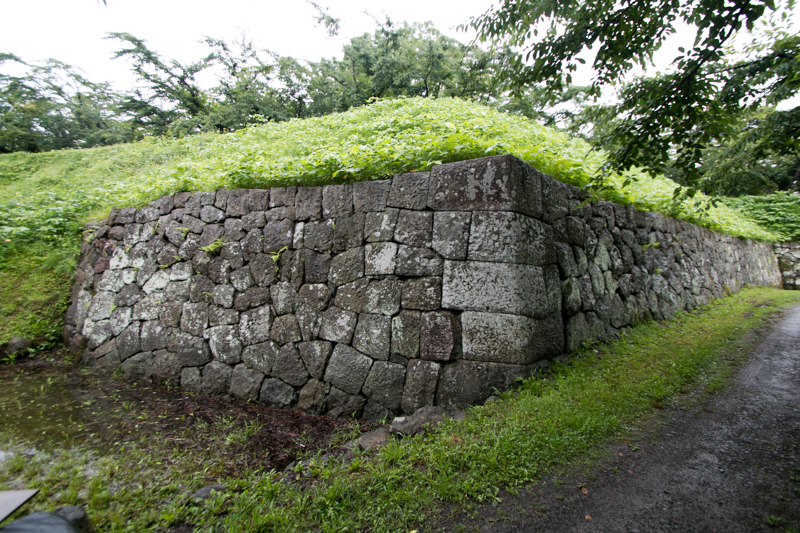 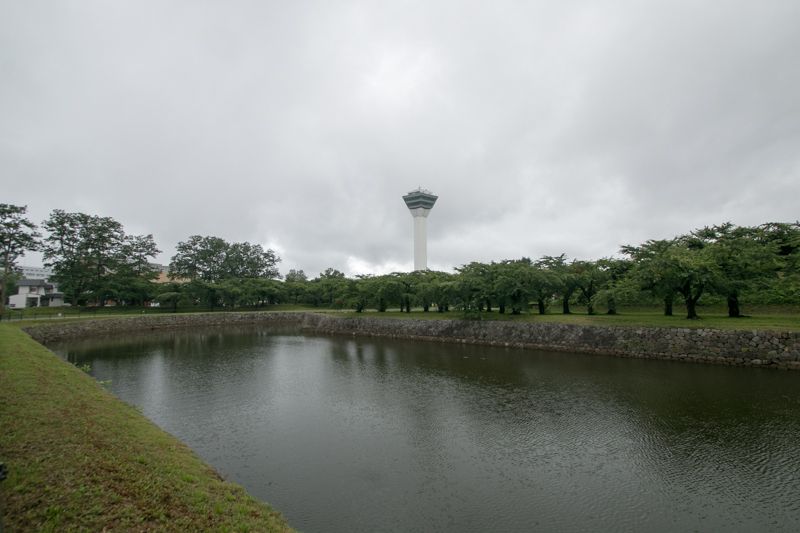 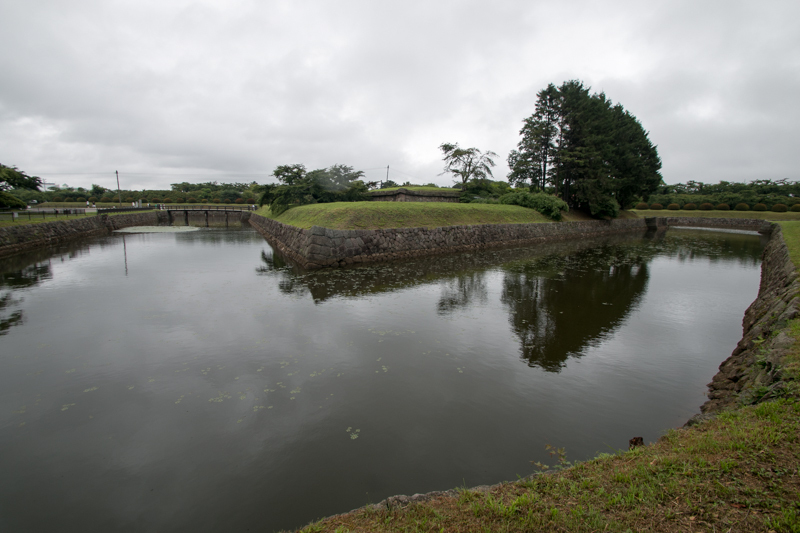 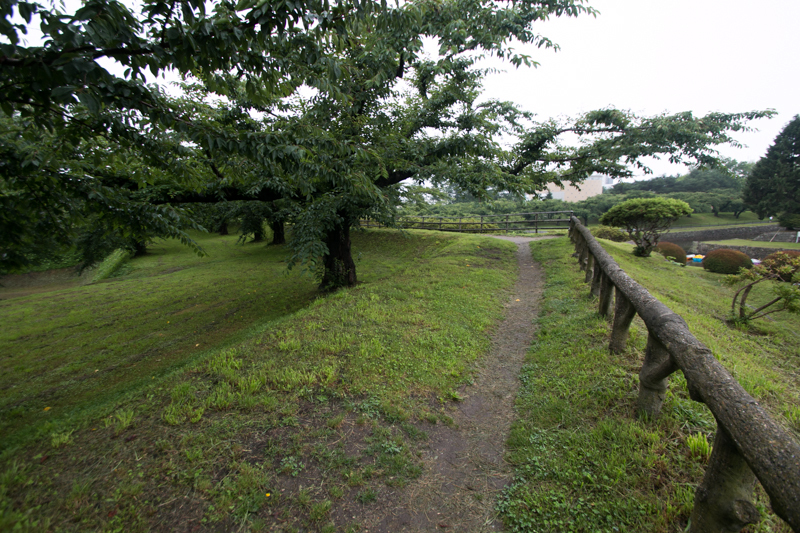 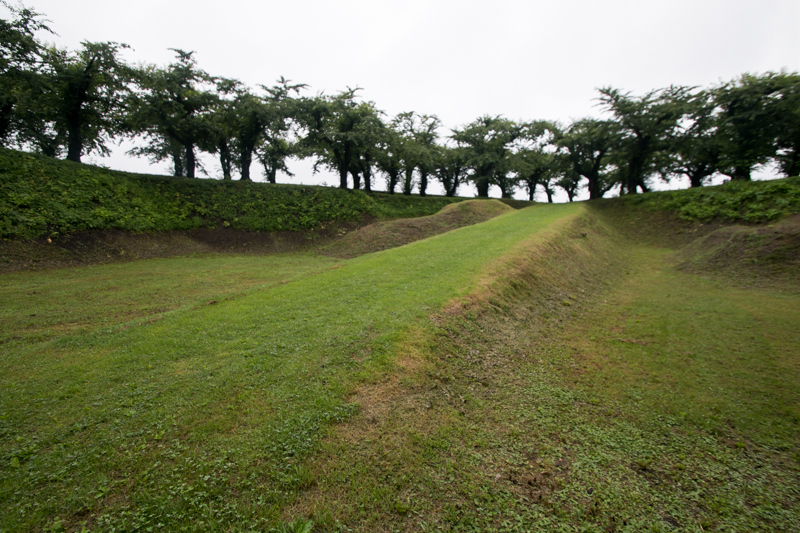 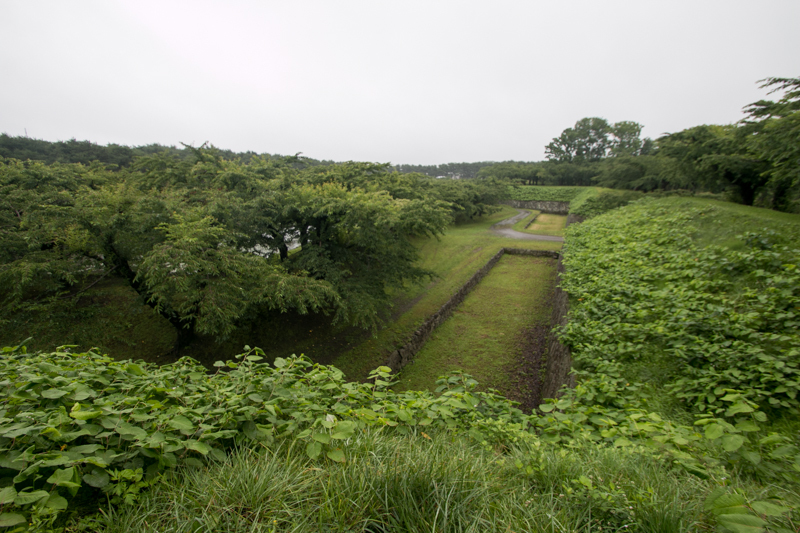 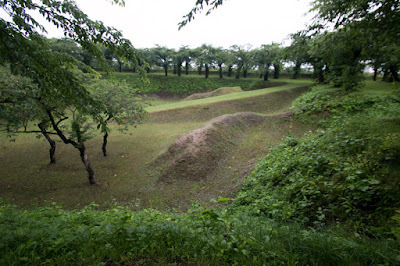 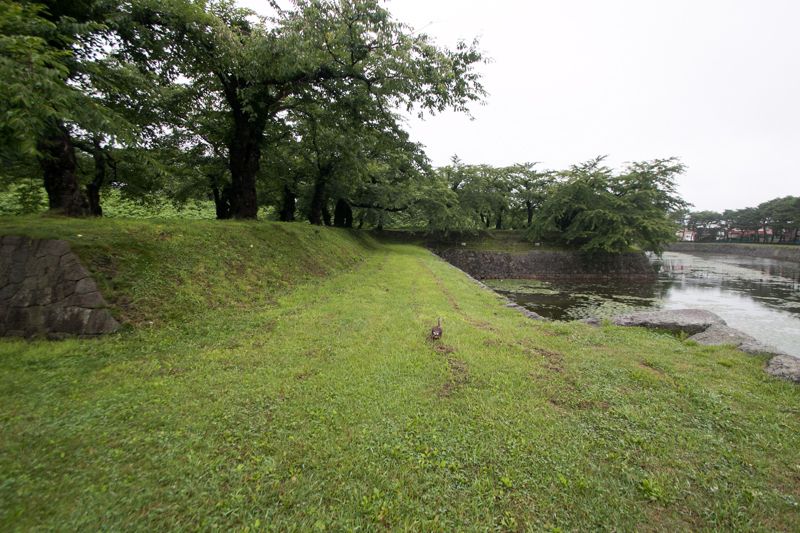 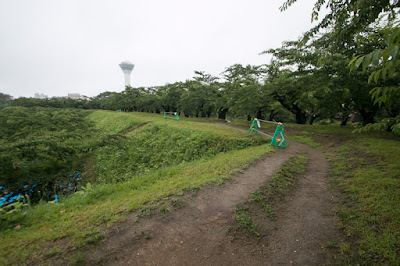 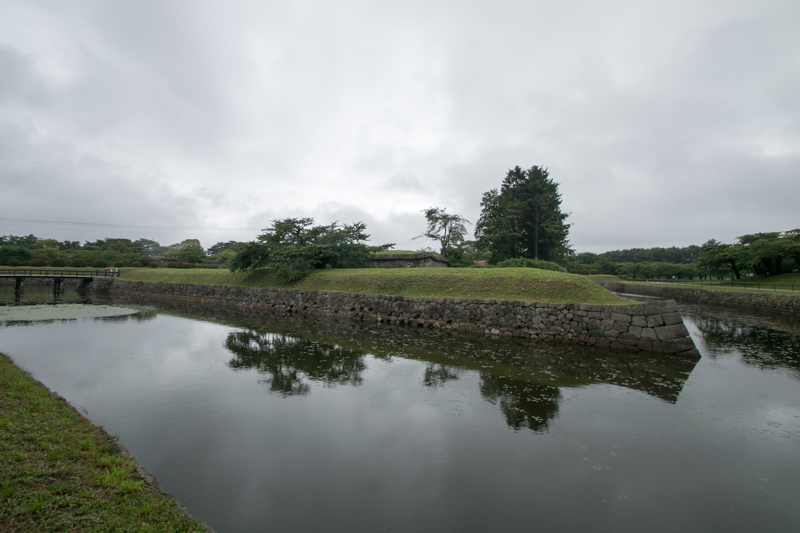 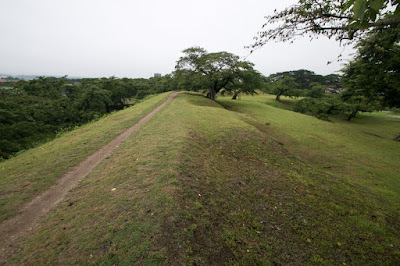 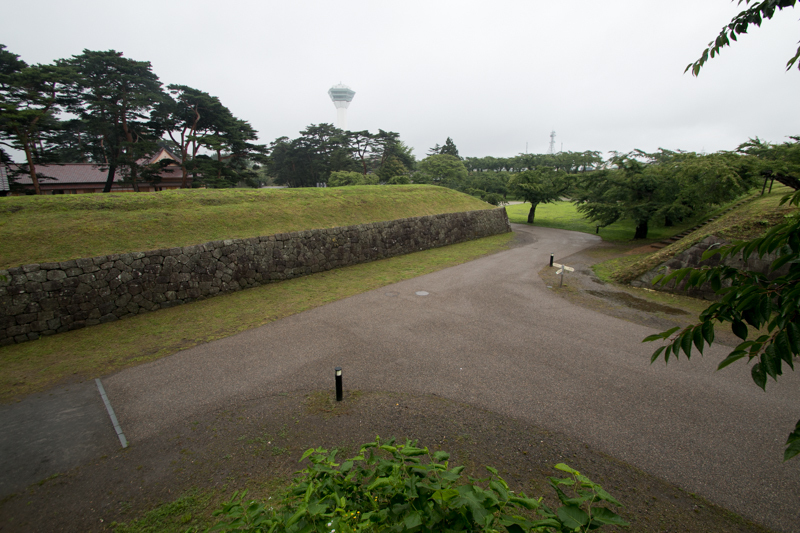 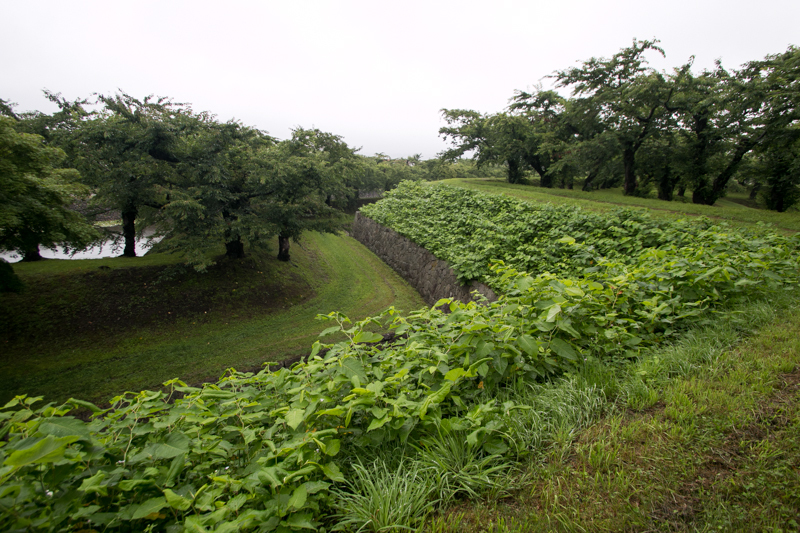 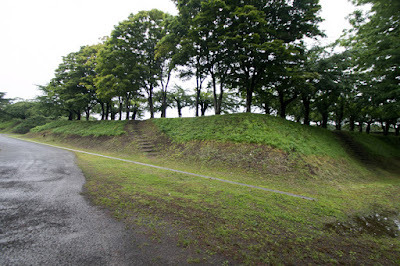 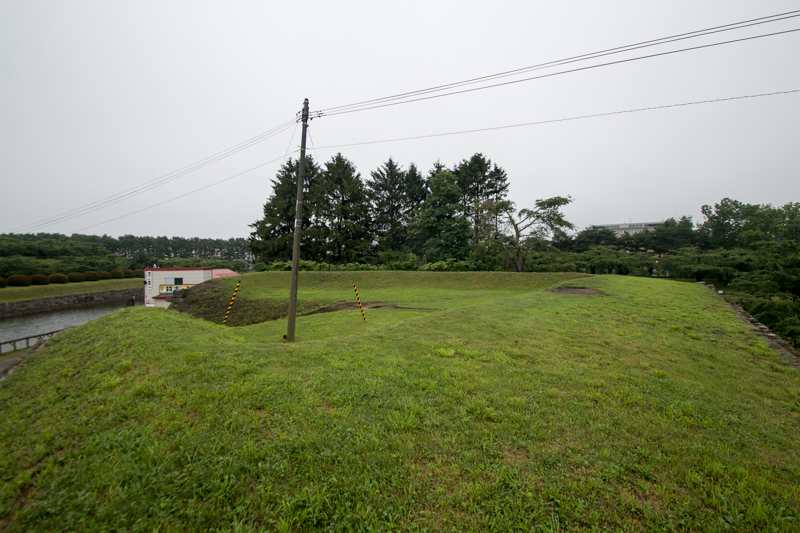 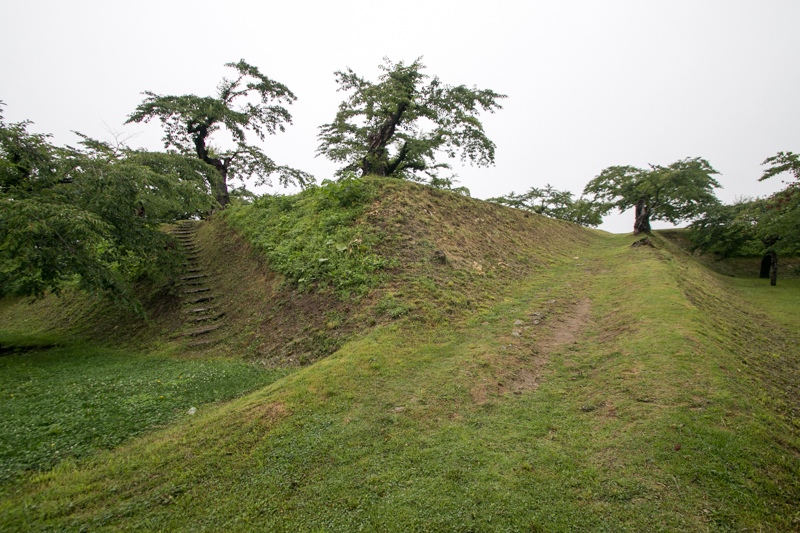 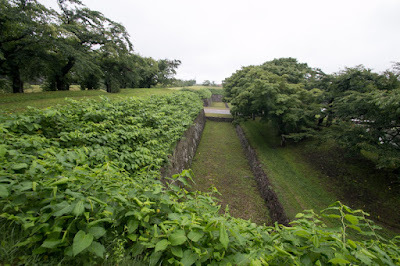 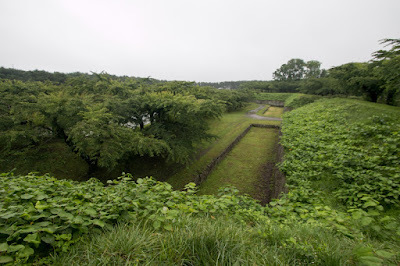 Compared with traditional Japanese castle, the height of clay wall is taller and only had singly story building, considering attack by cannons. Stone walls are used the lower part of basement layer to prevent collapse of clay walls, and also built around the gate expecting rifle shooting near the gate. At the tip of each corner slopes from the ground to the top of clay walls are built, to bring up huge cannon. 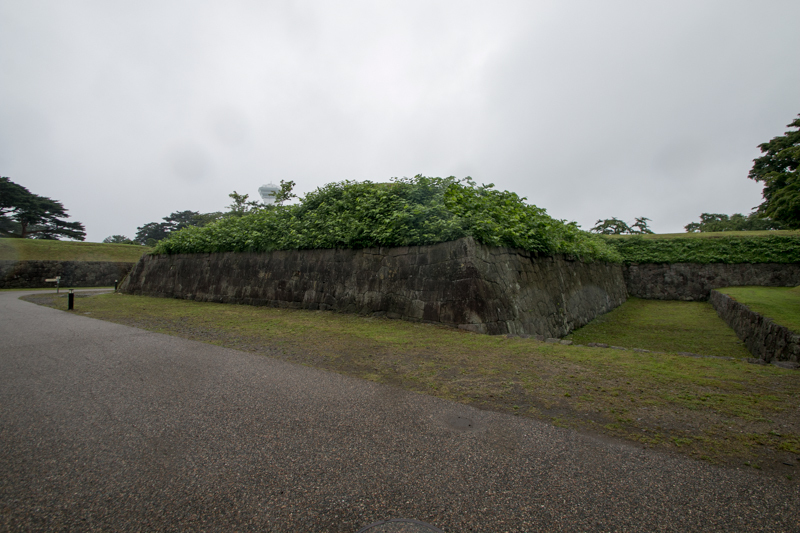 Munitions depot also located at the tip of the corner, where had the least possibility to be fired by enemy cannons. 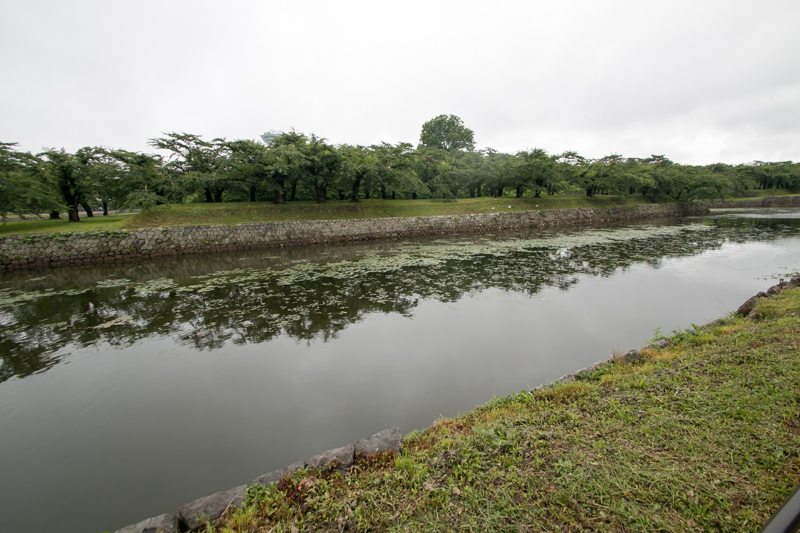 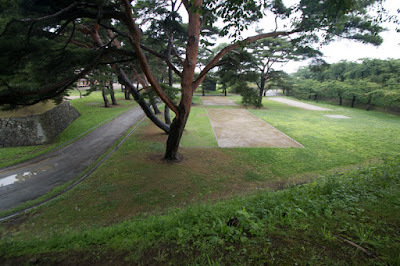 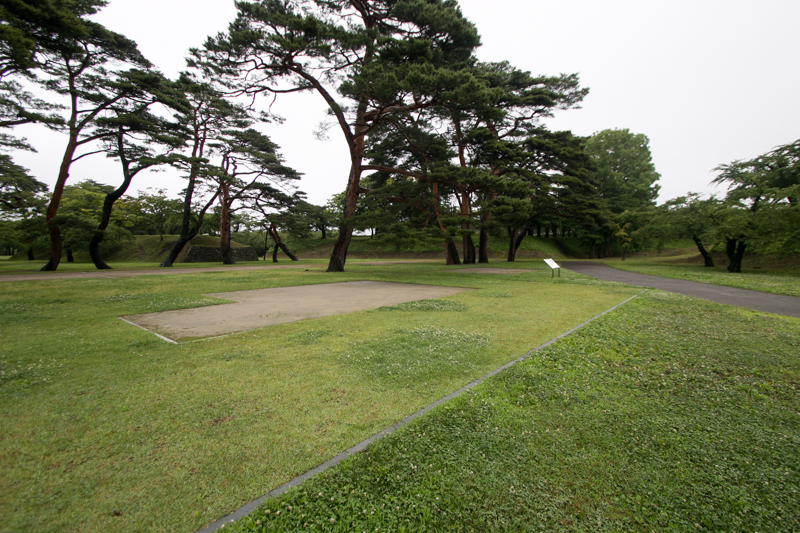 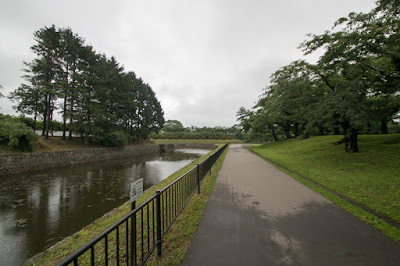 Total size of Goryokaku is a pentagon of 300 meter long line each. 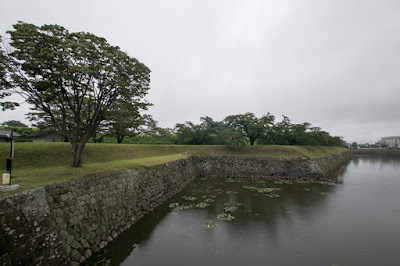 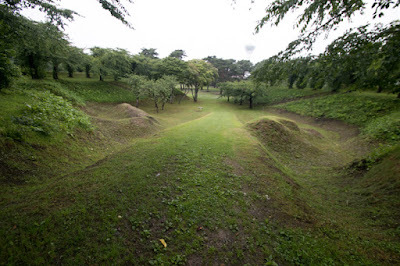 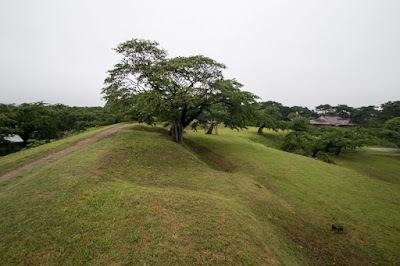 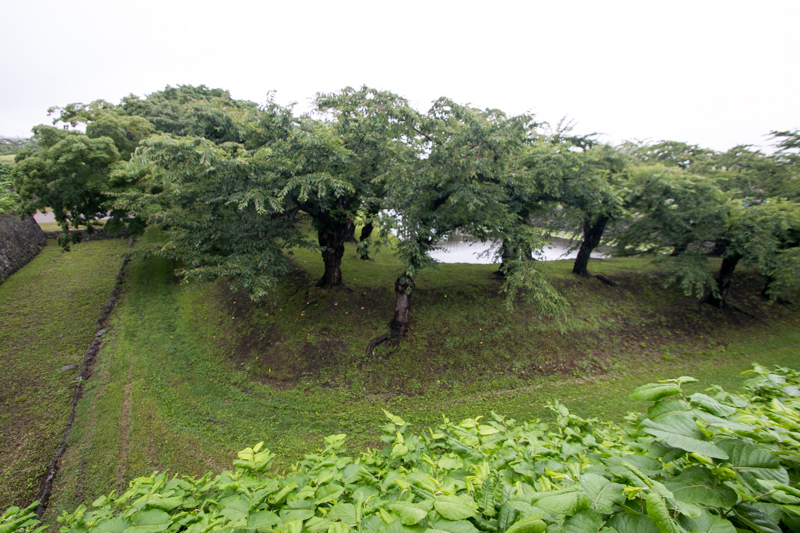 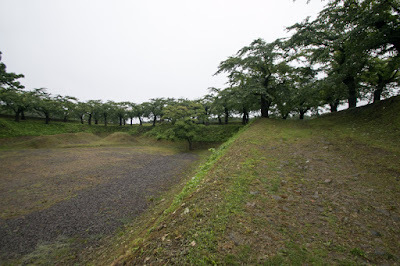 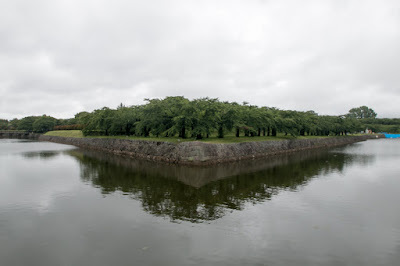 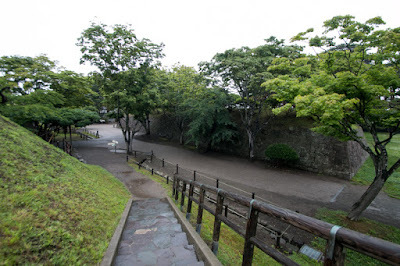 There were only three genuine western fortress in Japan, it mean Goryokaku, Shiryokaku which had a square shape and built at 5 kilometer north of Goryokaku as a front fort, and Tatsuoka castle locates at the inland area of Nagano prefecture. 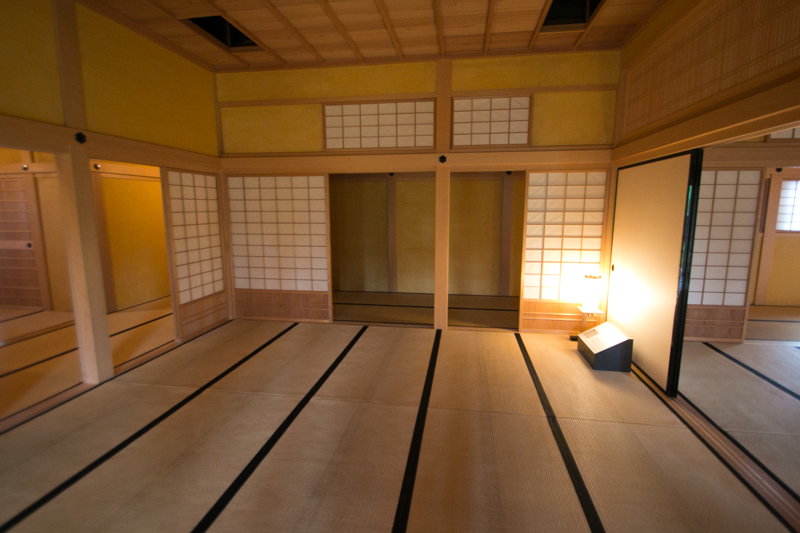 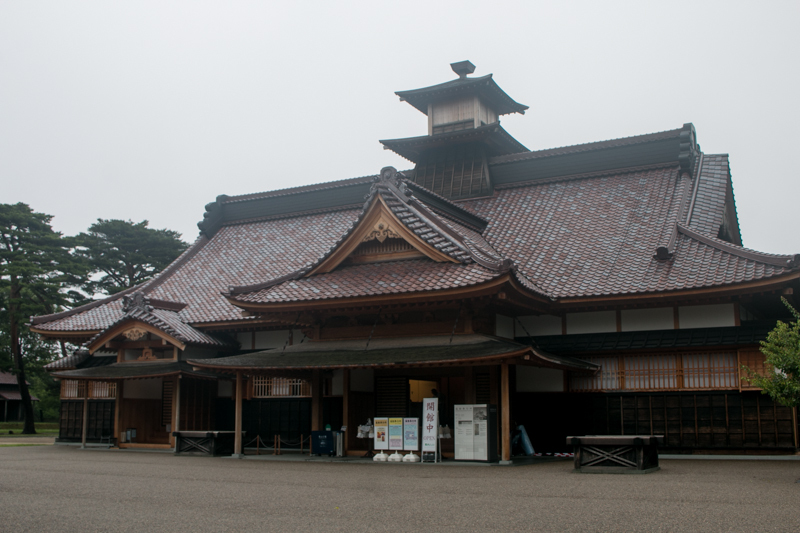 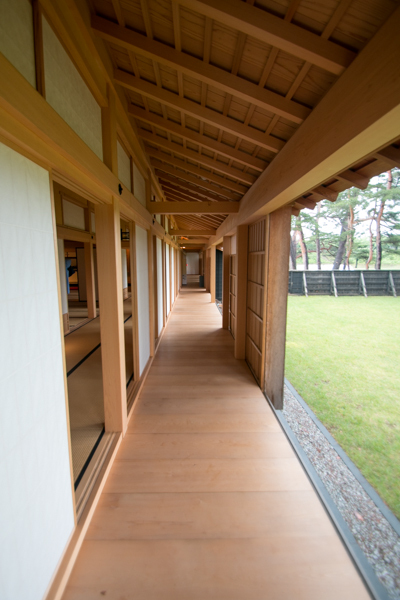 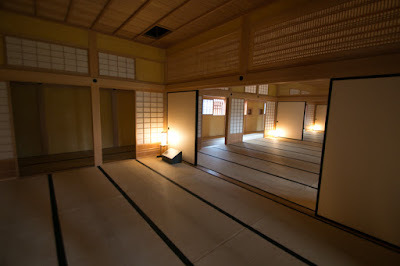 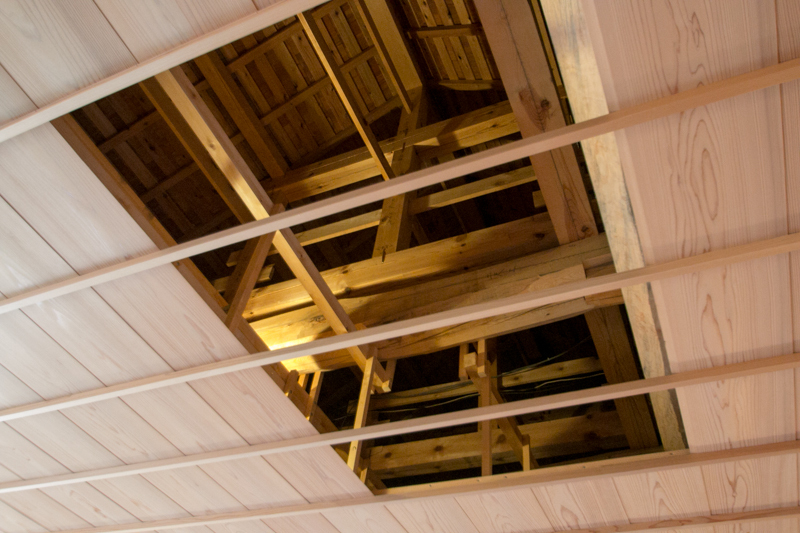 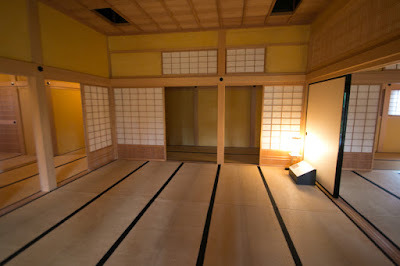 After completion, Hakodate magistrate office moved to the inside of Goryokaku. 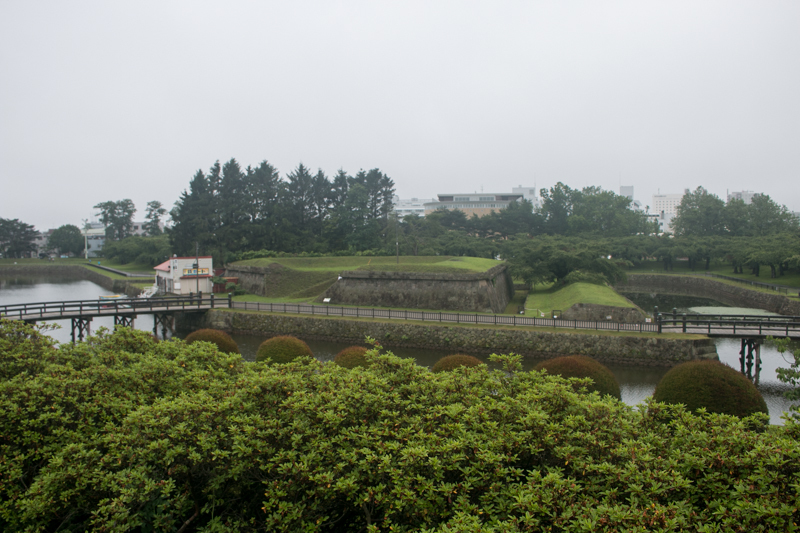 Just after the completion, Goryokaku was actually used to protect Hakodate city. 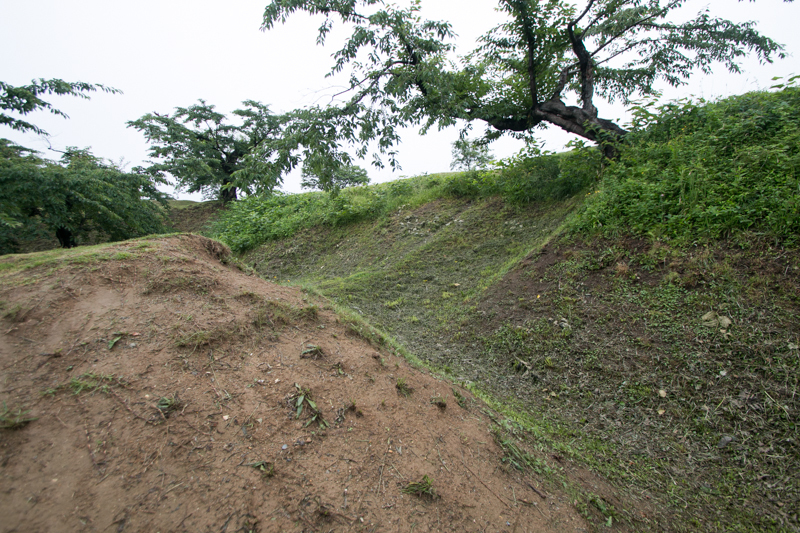 But it was not from foreign countries as expected, but from army of same nation. 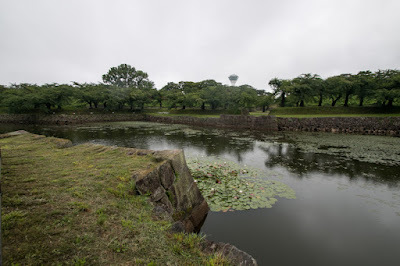 In 1867, Edo Shogunate which could not manage with the pressure from foreign countries and lost its authority returned its position as Shogun to Imperial Household, and tried to survive the largest lord under the emperor. 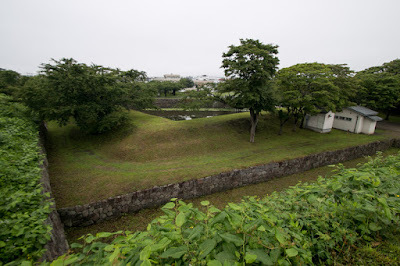 But anti Shogunate lords such as Satsuma domain (Kagoshima prefecture) or Choshu domain (Yamaguchi prefecture) moved Imperial Household and let them release the order to defeat Edo Shogunate. At the new year of 1868 anti Shogunate force and Shogunate army fought at Toba Fushimi, and Tokugawa army lost at this battle. 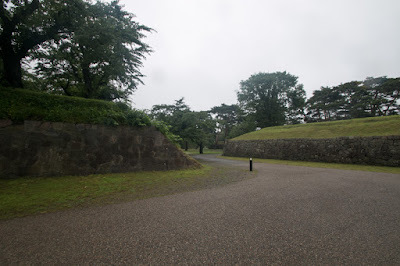 Yoshinobu Tokugawa (x-x), the last Shogun of Edo Shogunate, gave up resistance and returned to Edo castle. Anti Shogunate army formed new government, and marched toward Edo city. 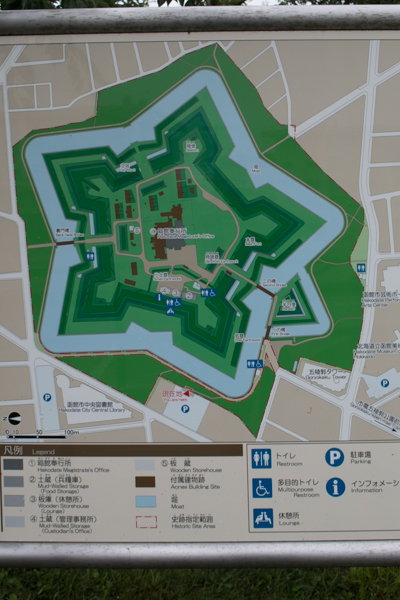 In March, new government army reached to Tokyo, and after negotiation Edo Shogunate bloodlessly opened Edo castle. Yoshinobu Tokugawa was moved to Suruga province (Shizuoka prefecture), and Edo Shogunate disappeared both in name and reality. But military leaders of Edo Shogunate were dissatisfied with this decision. 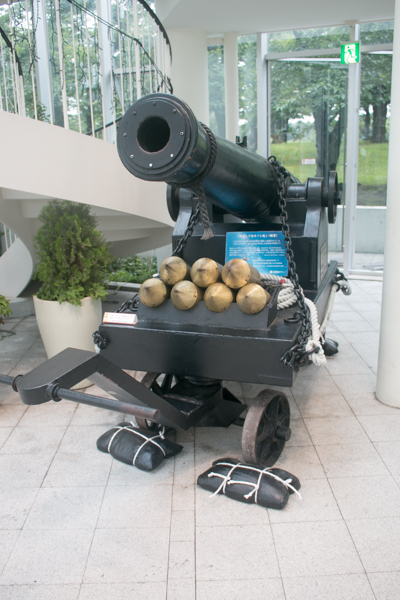 After opening nation, Edo Shogunate sent their person to foreign countries to learn western military knowledge, and bought new weapons and battleships. In August, Takeaki Enomoto (1836-1908), the vice commander of Shogunate navy, lead remaining fleets of Shogunate consist of nine frigates and departed toward north. Takeaki once studied at Netherland, and ordered warship Kaiyomaru during his visit. Takeaki had wide range of knowledge for military and politics, and was an ambitious person. Takeaki and his fellow tried to sail to Sendai domain, which was the core of anti new government alliance. 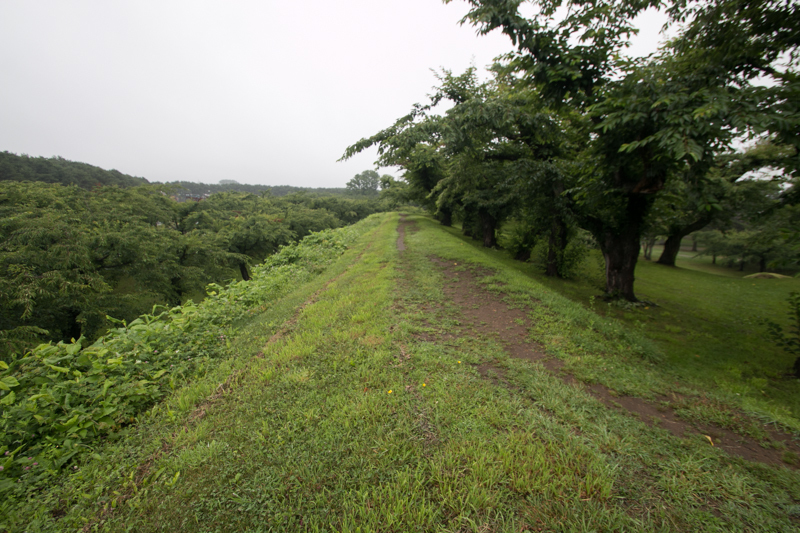 But because of accident they lost some ships, and remaining vessels barely reached to Sendai in September. 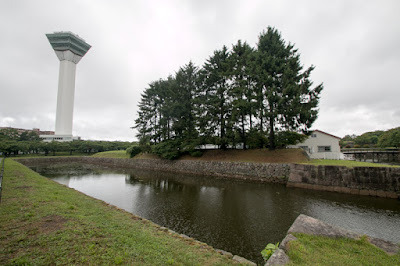 But facing dominant new government army anti new government alliance already collapsed, and Sendai domain surrendered to new government in September. 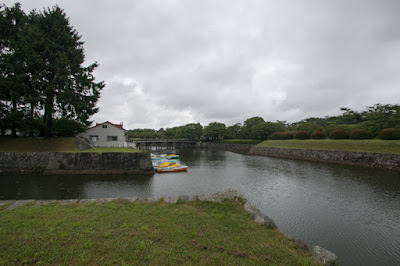 Looking at this situation, Takeaki planned to occupy Hokkaido island called as Ezochi at that time. 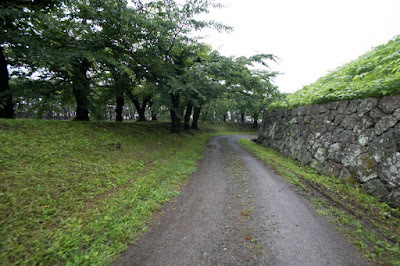 In October, Takeaki accommodated remaining former Shogunate army lead by Keisuke Otori (1833-1911), and Toshizo Hijikata (1835-1869), and departed for Hokkaido. 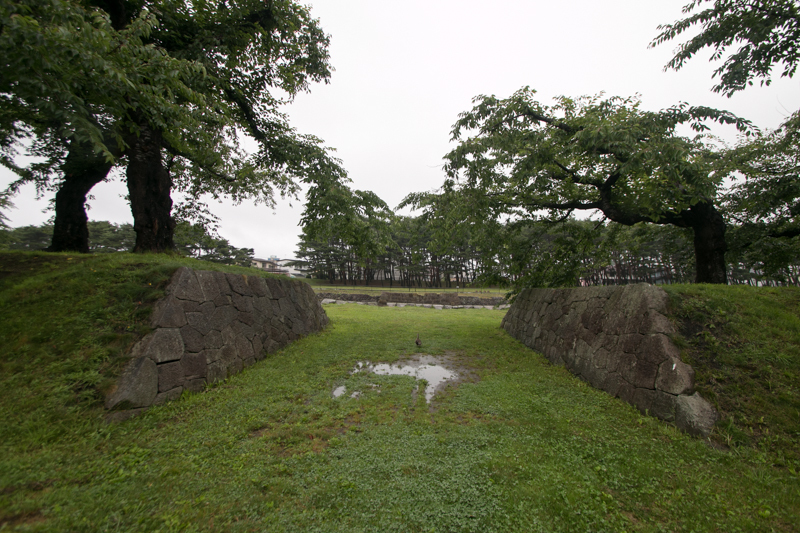 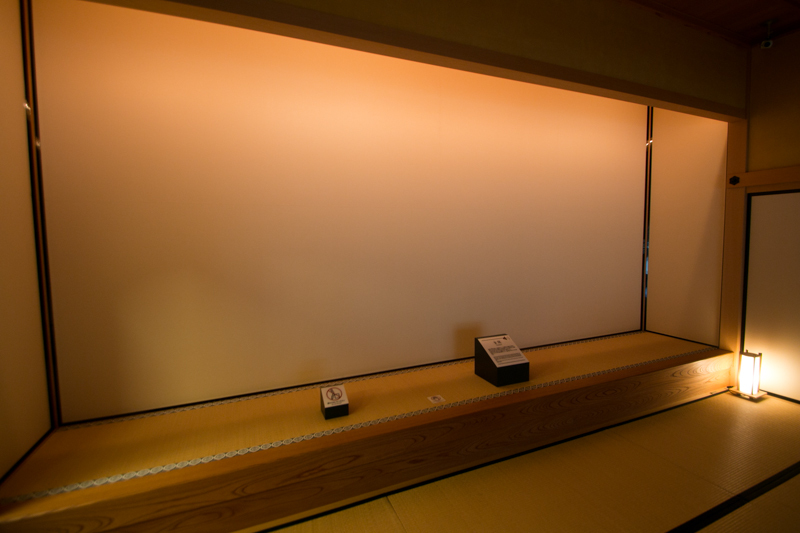 Number of former Shogunate army was already small, but struggled severe battle and was lead by two brilliant leaders. 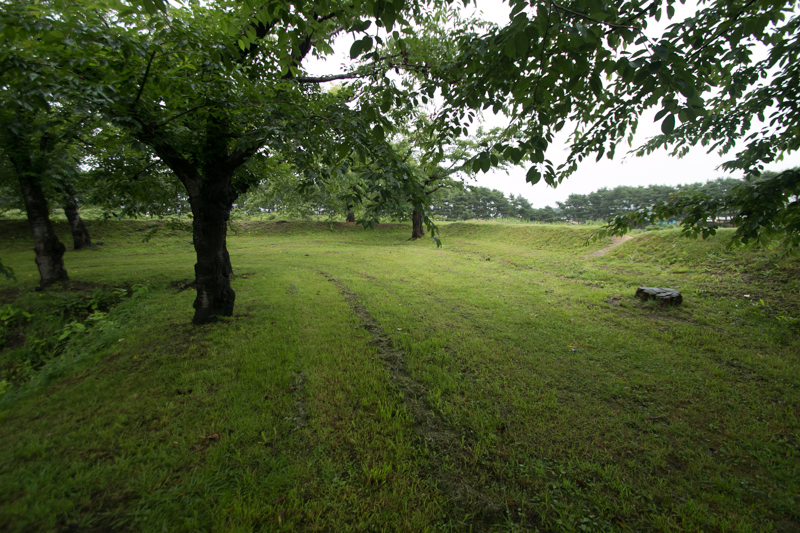 Keisuke Otori had learned tactics in France, and shows his talent during the battle and often broke overwhelming new government army with small soldiers. 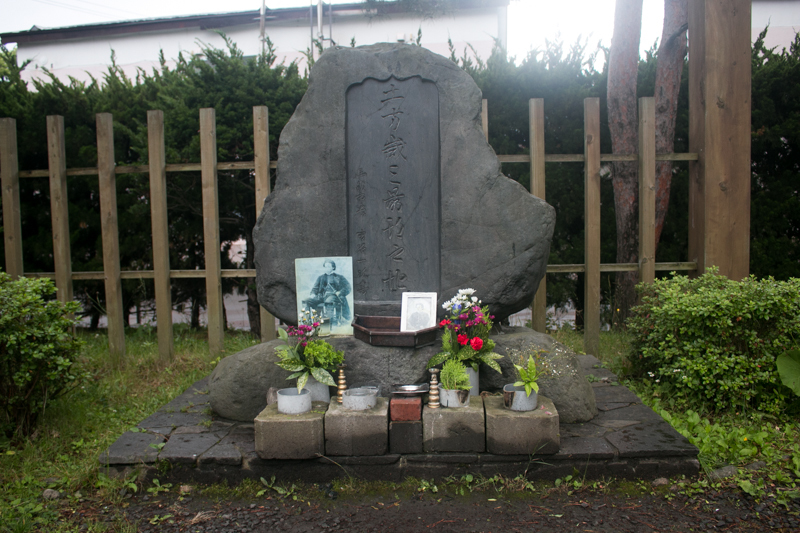 Toshizo Hijikata was formerly vice leader of famous swordsman group Shinsengumi, and not only an excellent sword master but also could command the force well. 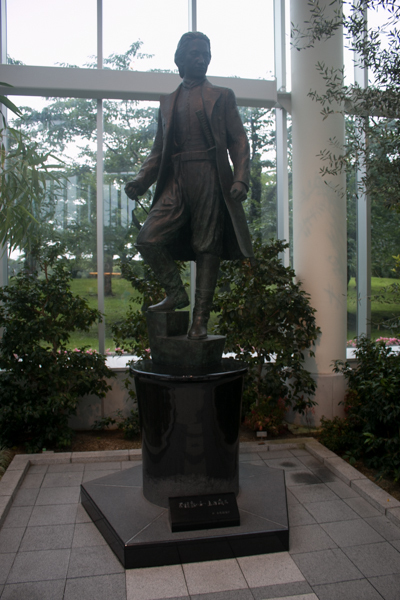 Hijikata is also known as a good looking guy. 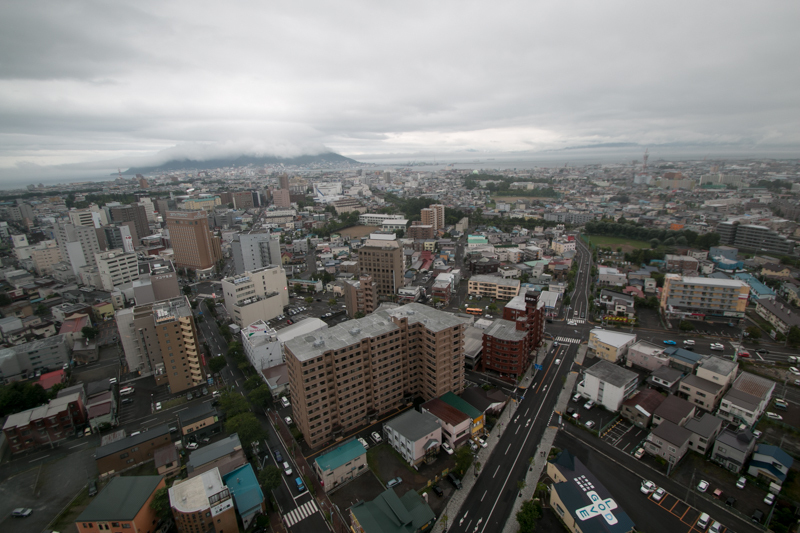 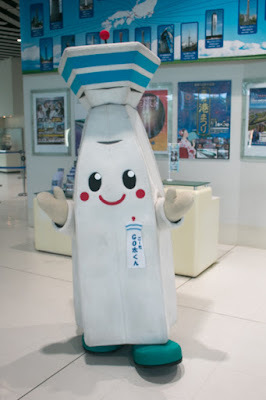 In October, Enomoto force arrived at Hokkaido island and landed at the north of Hakodate city. 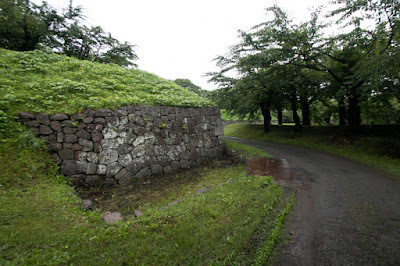 Enomoto army soon occupied Hakodate city including vacant Goryokaku, and next attacked Matsumae domain. Matsumae domain was a small domain and just confused by their internal conflict, and leader of Matsumae domain ran away to Honshu mainland. By the end of November, Enomoto army captured whole Toshima island and declared the establishment of Ezo republic in December. Takeaki Enomoto became the president, and Keisuke Otori and Toshizo Hijikata were appointed as a commander and vice commander. 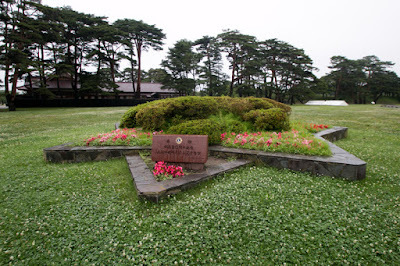 But there was a huge gap of power between Meiji new government and Ezo republic, and Meiji government was expected to never allow the independence of Enomoto group. 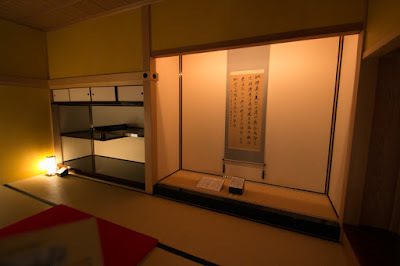 Takeaki who had western knowledge tried to gain legitimacy by making diplomacy with foreign provinces and performing election internally (might be the first attempt in Japan), but these policy did not bring effective result to them. 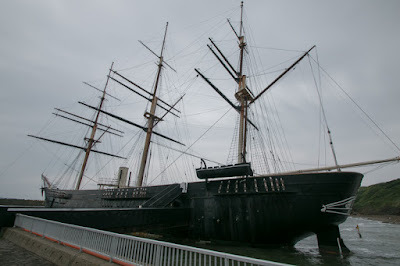 Furthermore, warship Kaiyomaru, the largest warship of former Shogunate fleet, was lost near Esashi town in an accident at the siege of town, and it became difficult to prevent the landing of Meiji government army after next spring. 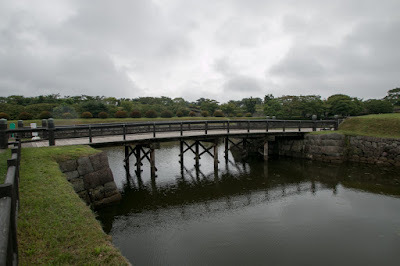 In April 1869, Meiji government army landed at Esashi town. Ezo Republic army could not prevent this landing, because they lost several ships at their attempt to surprise attack to the navy of Meiji government which anchored Miyako bay of Miyagi prefecture. 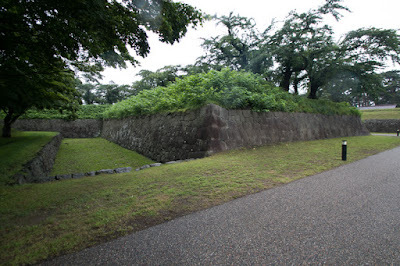 Meiji government army easily captured Esashi town, and started marching toward Hakodate city. On May 11, government army surrounded Hakodate city made a total attack. Ezo Republic army built the defense line at the root of the peninsula, and Siryokaku fort at the north edge of this line was easily captured. At the same time, Meiji government army made a surprise attack from backside of Hakodateyama mountain, captured the top and shoot cannons toward the town and port along with battleships at the bay. Toshizo Hijikata tried to rescue the central town, but was shot on the way and ended his 34 years old life. 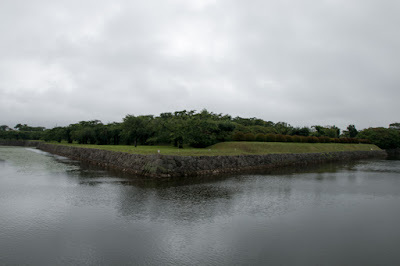 To rescue the town remaining battleships of Ezo Republic charged into Meiji government fleet, but was stoke back and lost all ships. 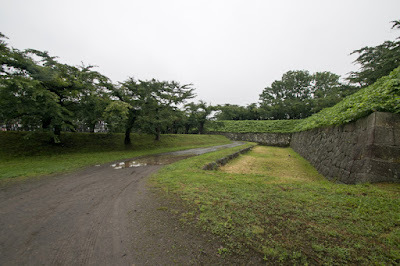 Keisuke Otori persevering commanded his army, but even with brilliant tactics it was impossible to reverse the situation. At last, in May 18, Ezo Republic surrendered to Meiji government and the battle of Hakodate has ended at 7 month from its occurrence. 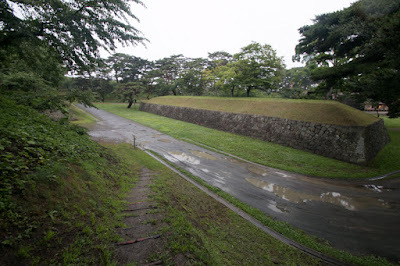 Even though being defeated, Takeaki Enomoto and Keisuke Otori was evaluated their talent, and later promoted to high class person of Meiji government. 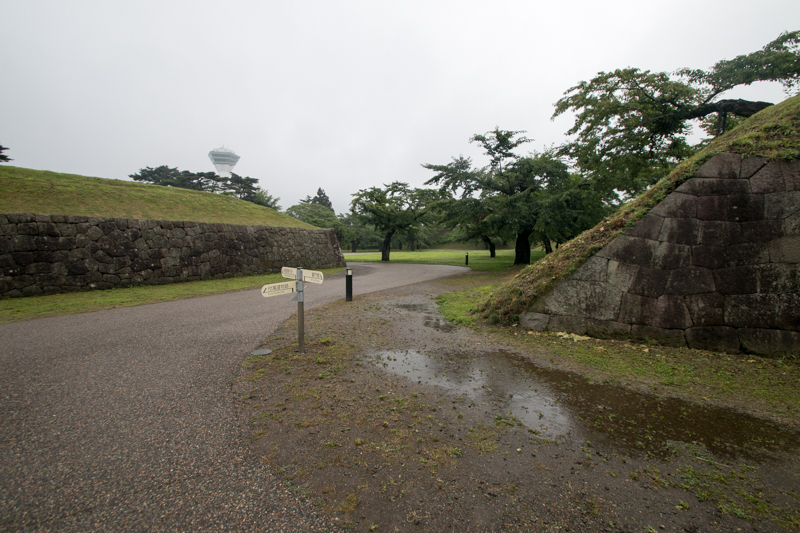 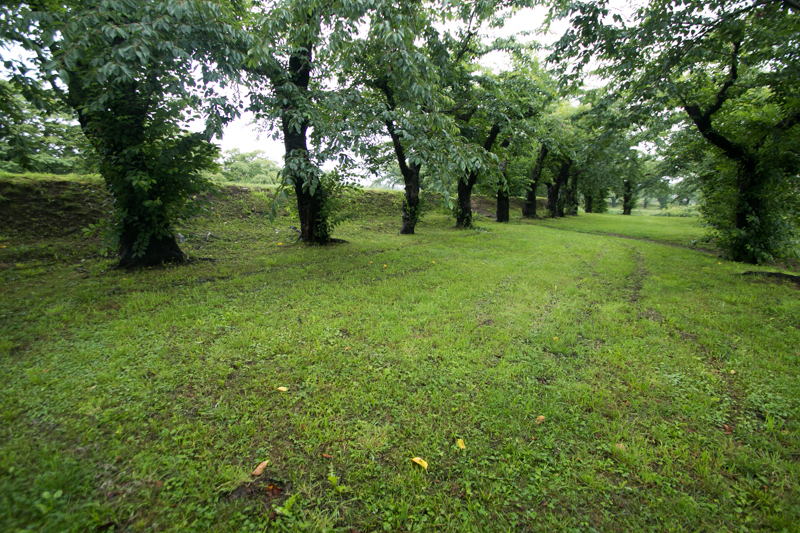 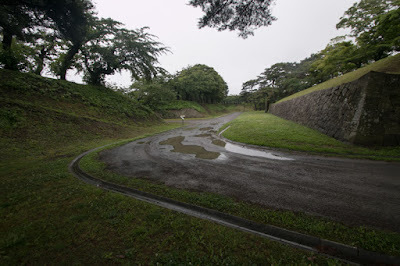 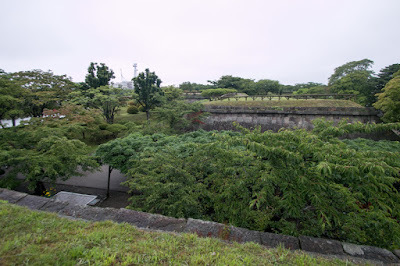 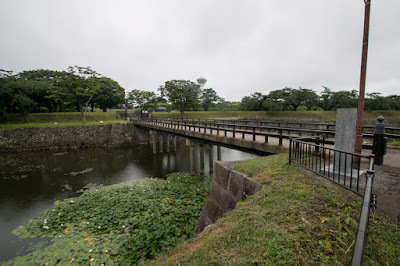 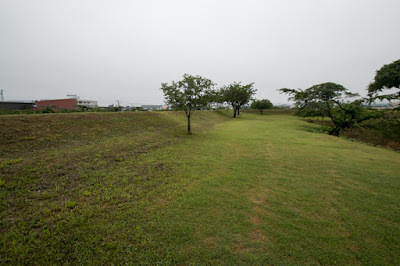 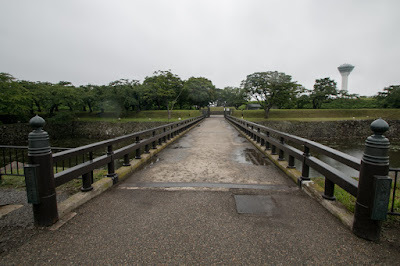 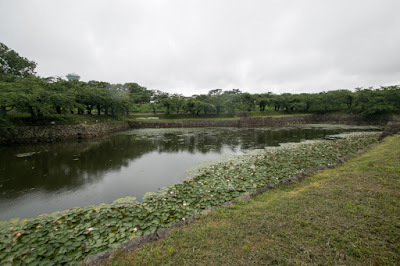 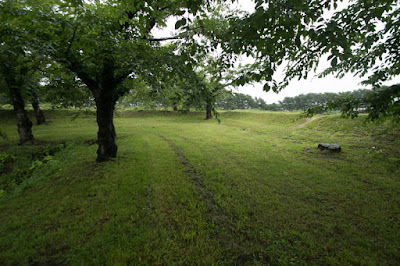 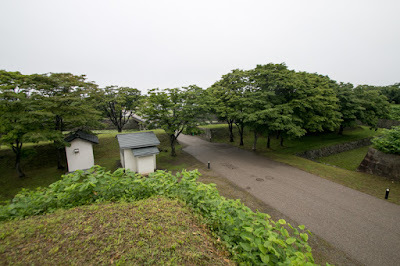 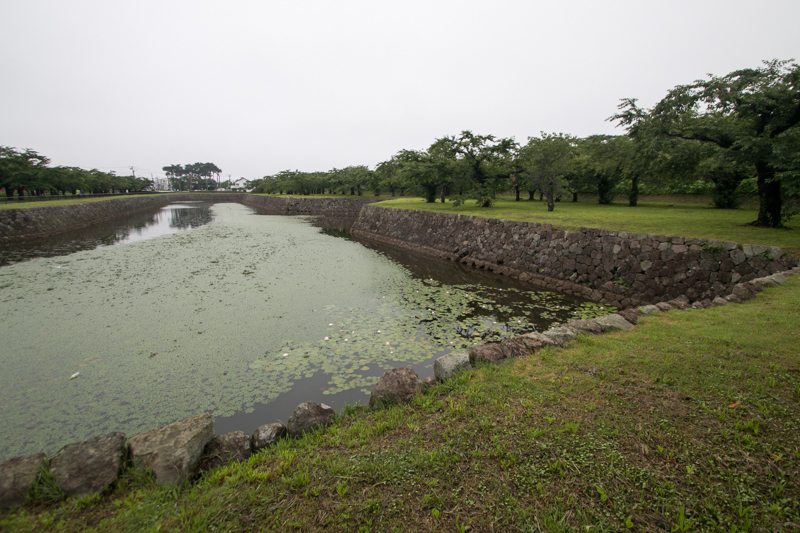 After the cease fire Goryokaku fort was abolished only 10 years after completion, and once used as a place of military base. 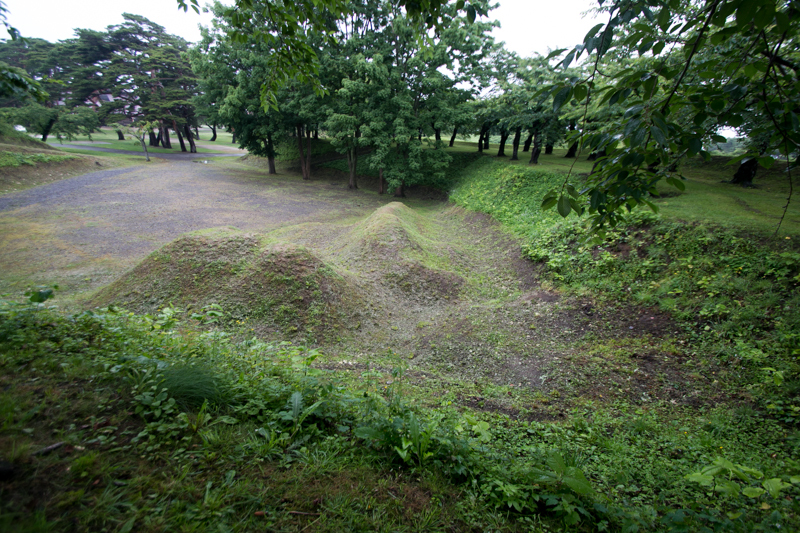 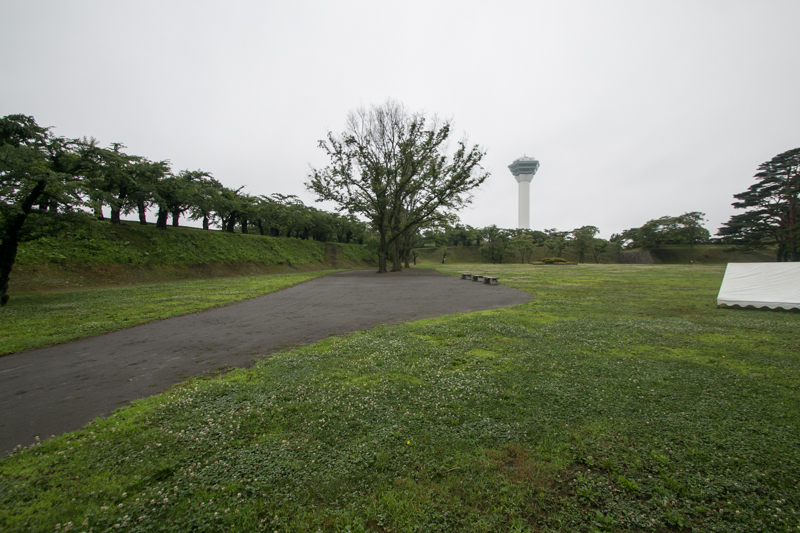 Later the site of the castle turned into a park, and main building of Hakodate magistrate office was reconstructed in 2010. 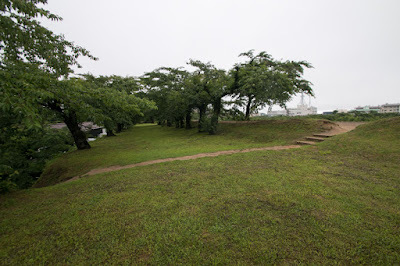 Goryokaku itself has a plain structure and it is not so impressive to see at ground level, but from the top of Goryokaku tower at the next of the site its star like shape is seen in full view. 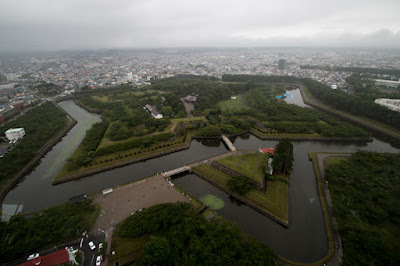 Even though being defeated, spreading shape of the castle is still the symbol of building new government in turbulent era by the group of talented people. 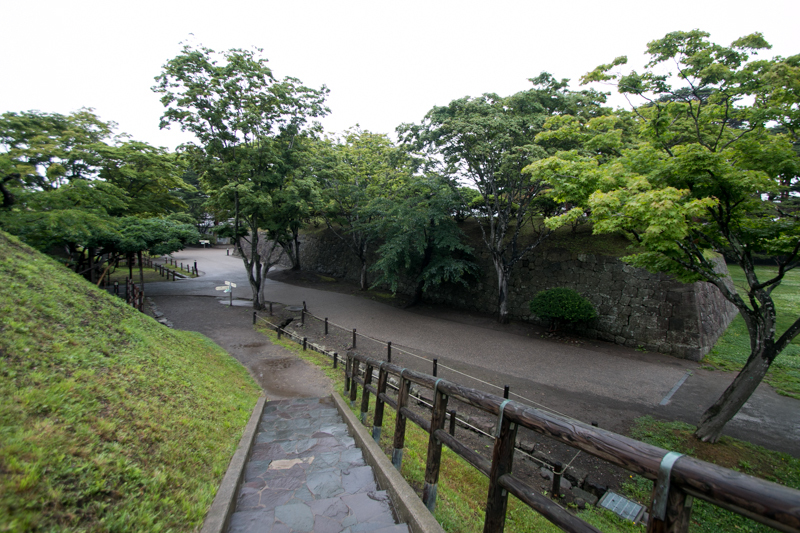 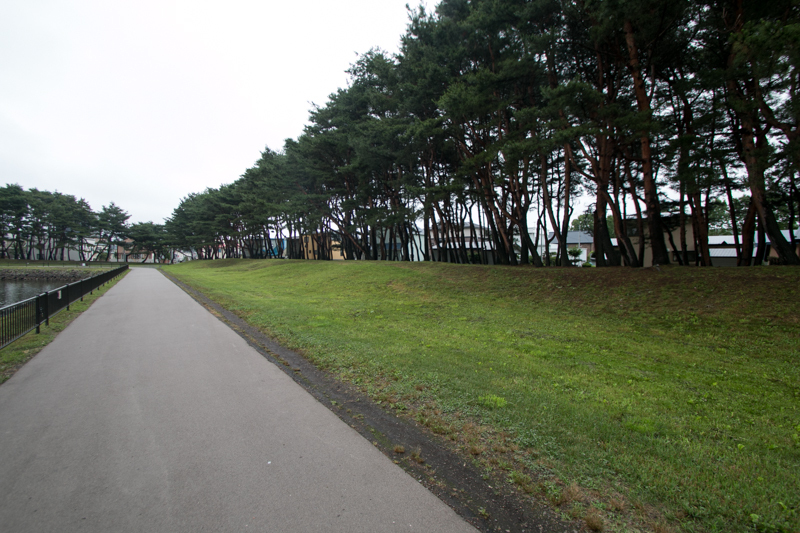 10 minutes walk from Goryokaku Koenmae station of Hakodate City tram. 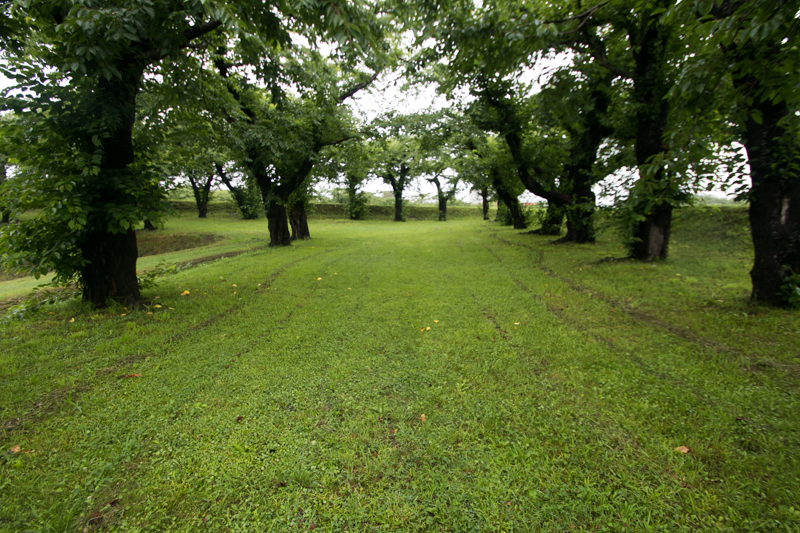 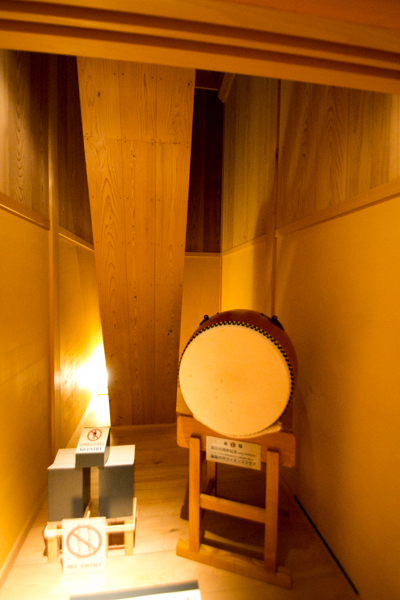 30 minutes drive from Hakodate airport.